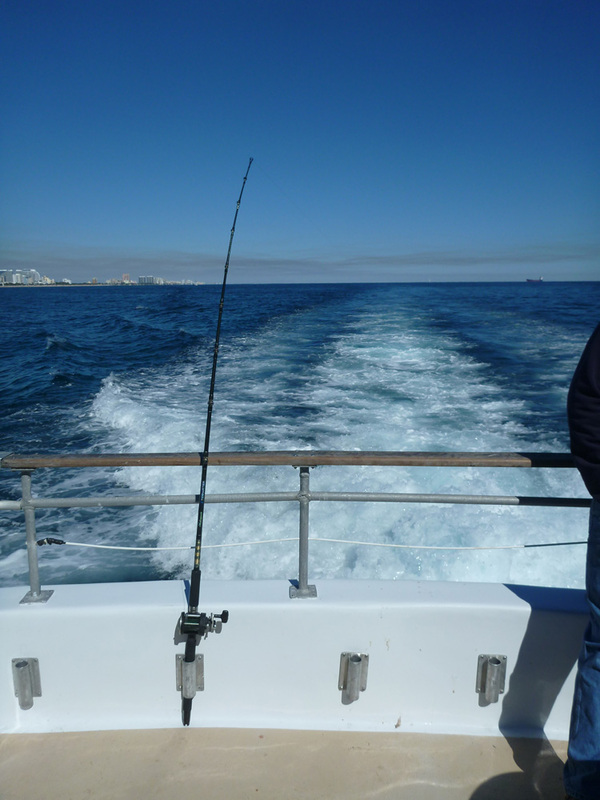 I wanted to go fishing this weekend so I called the Reward Fishing Fleet to book a spot on their special all day trip, for $100 it’s a nice bargain to go out all day fishing without having to go back to the docks and the wait for the boat to leave back on the next trip (taking two 4 hour trips on the same day). 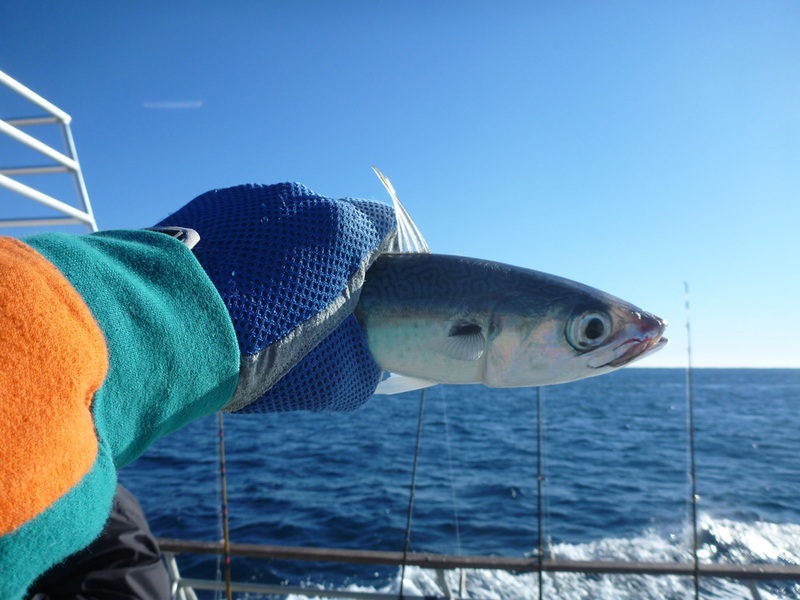 The trip started by gathering bait. 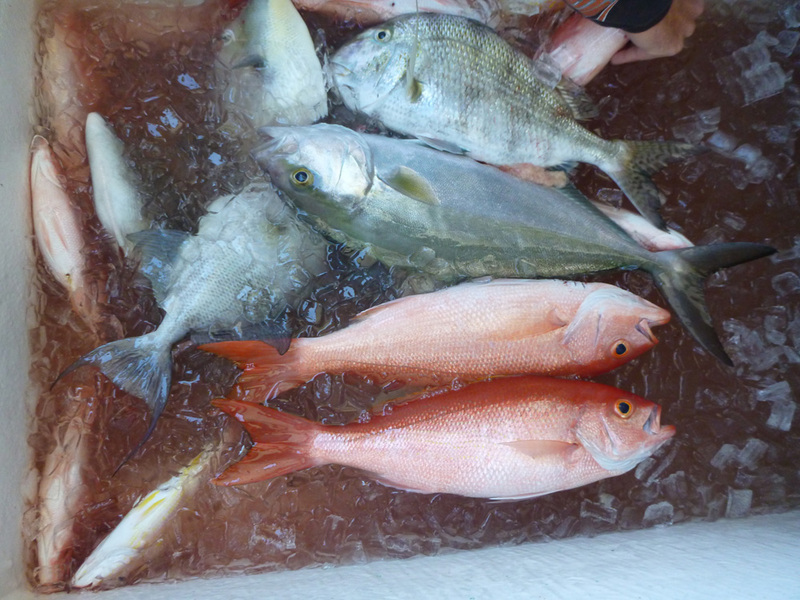 The mates and a few other fishermen collaborated with catching white bait, pinfish, and small grunts. 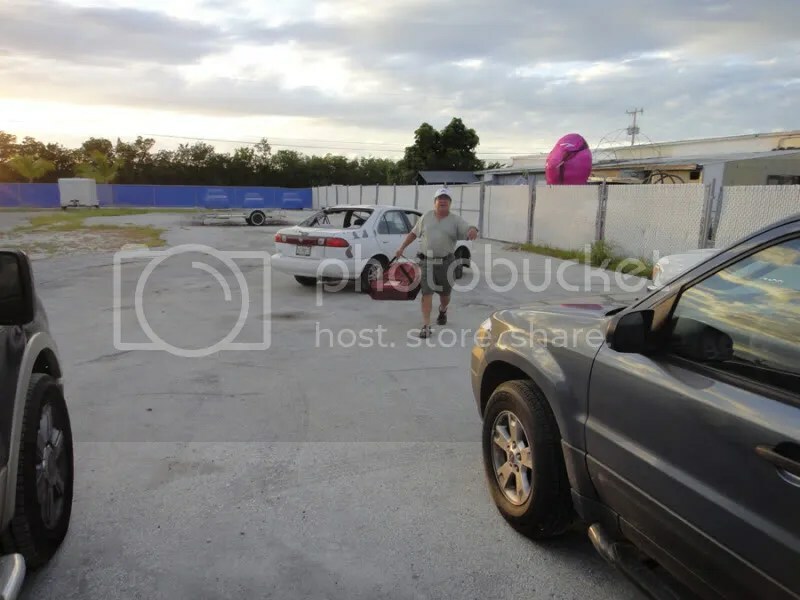 Once the bait was non responsive we moved onto another bait spot, the famous Bent Marker outside of Government Cut Miami. 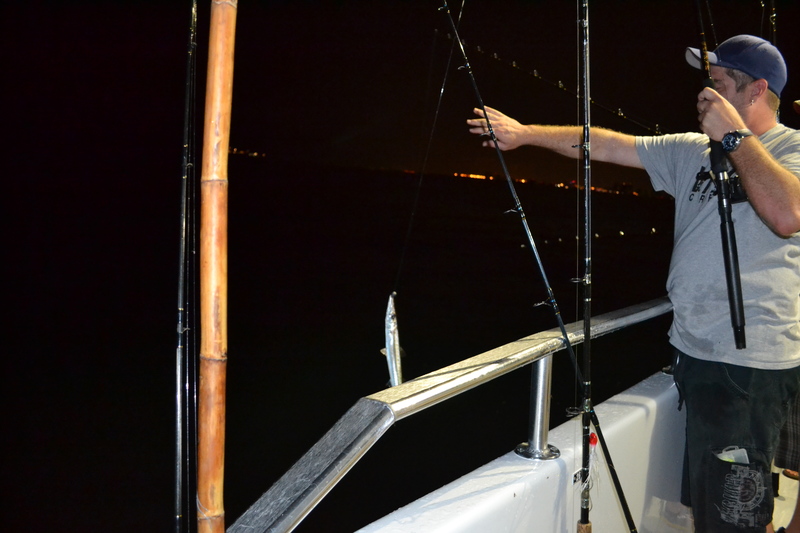 There we met with a numerous amount of boats trying to catch bait themselves. Below is a pic of the Marker. 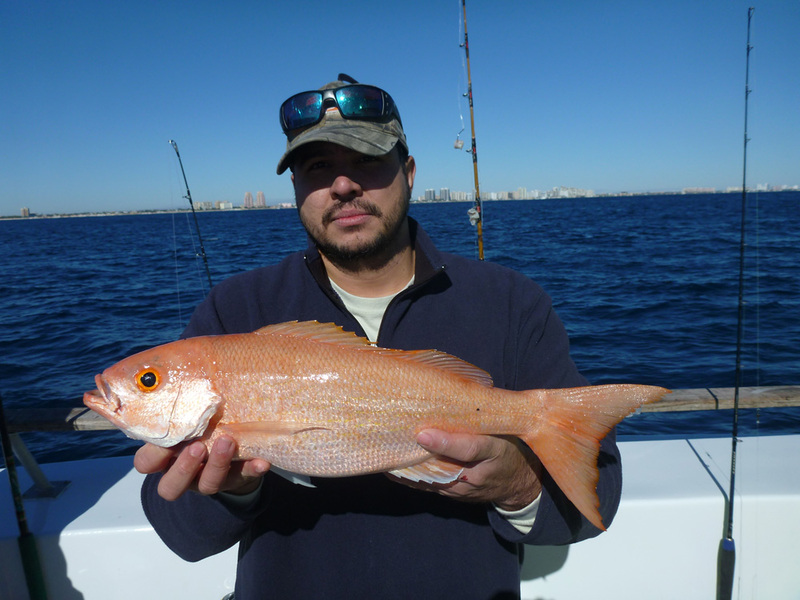 We then moved up to several other spots where people were catching vermilion snappers, Amberjacks, and Almaco Jacks. 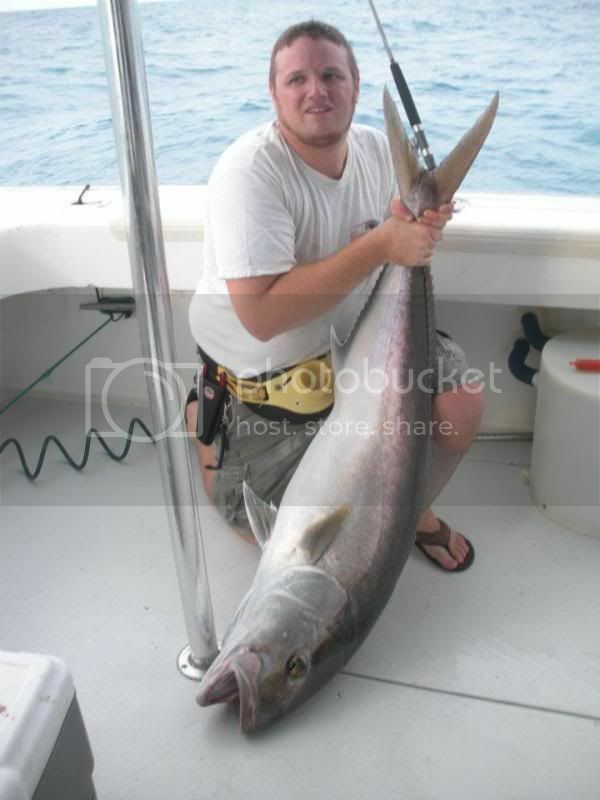 Jongsoo caught an Amberjack that was tagged, the fish was lip gaffed, taken a picture of, measured and released again. 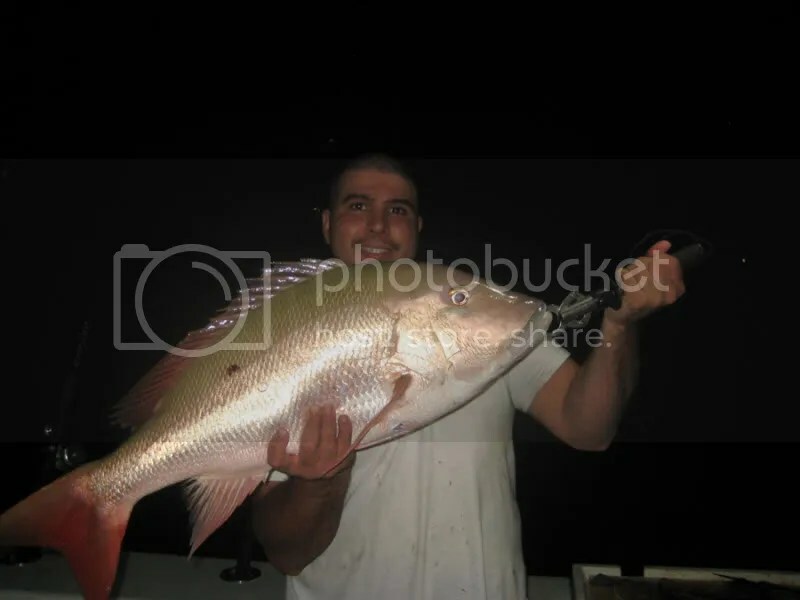 Below is Jeff the mate before measuring the fish. Sorry I didn’t take a pic of you Jongsoo. 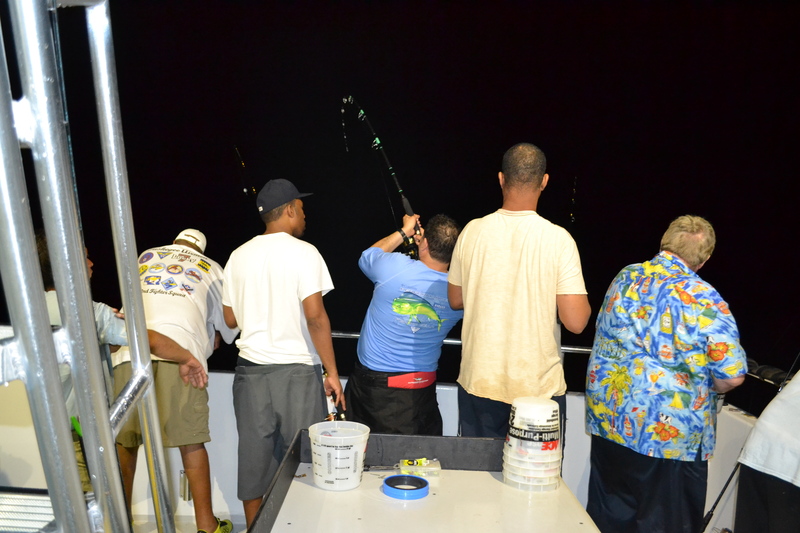 On the next move we saw some birds but nothing was biting under them, we kept moving and then as we stopped to fish I saw a Mahi Mahi and let everyone know, I wanted to make sure someone got it before it left. 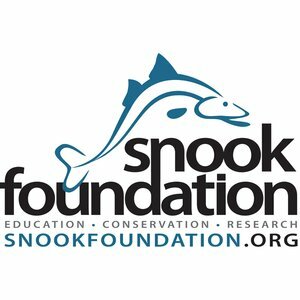 Leaving a caught Mahi Mahi hooke in the water will bring others closer to the boat if they are schooling together. 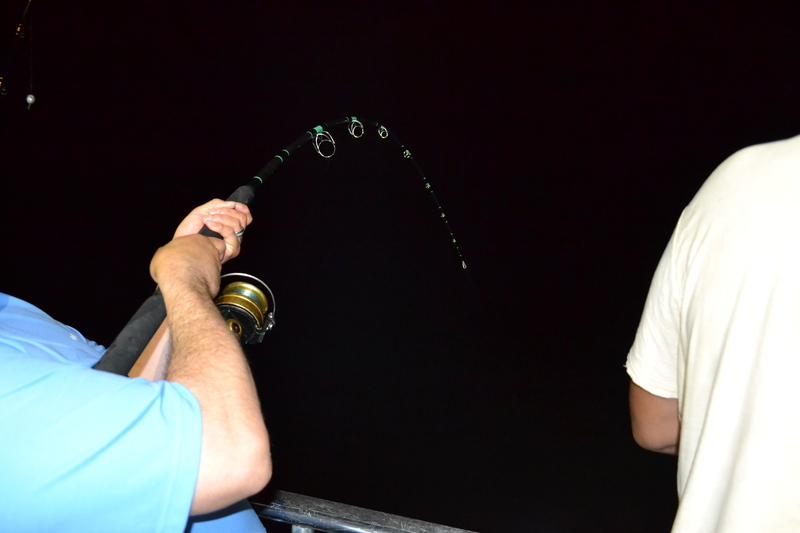 I went to get my plug rod as Will sent his out first cast catching the first Mahi Mahi. I sent my plug flying out and as I retrieved it with a sweeping motion I caught the next Mahi Mahi with an H4L Wingman plug. I caught another right after while using the same plug. 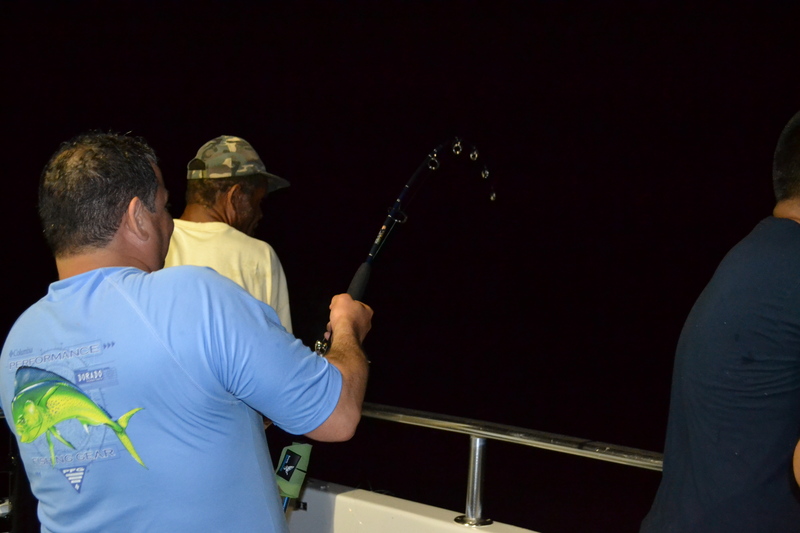 One of the mates set up some pitch rods and people started catching more mahi mahis including Jared who was ready with his own pitch rod. 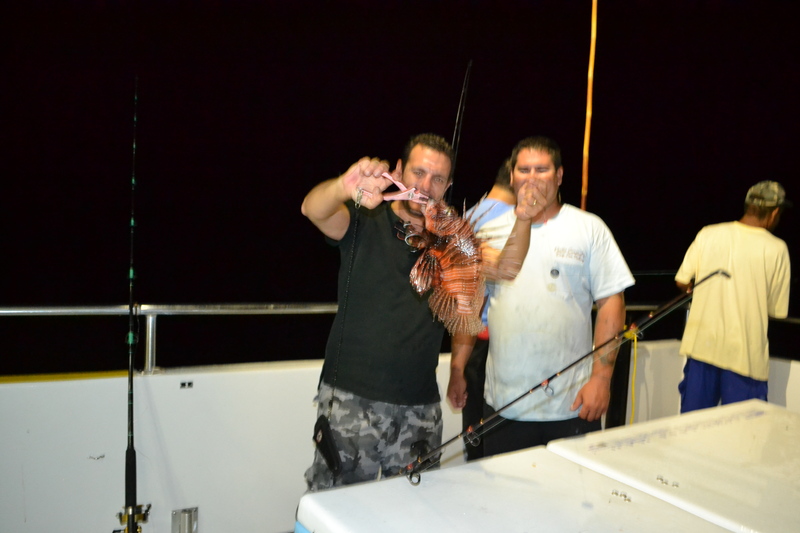 A total of 12 were caught ensuring many would take a nice dinner home. Below is mines. At one of the spots we started to get a few small Blackfin Tunas, mines was one of the smallest ones and one of the fishermen by the name of Ben whom is another experienced slow pitch jigging fisherman that was only using jigs caught the biggest one, a football size one with enough meat to get a couple dinners out of it. 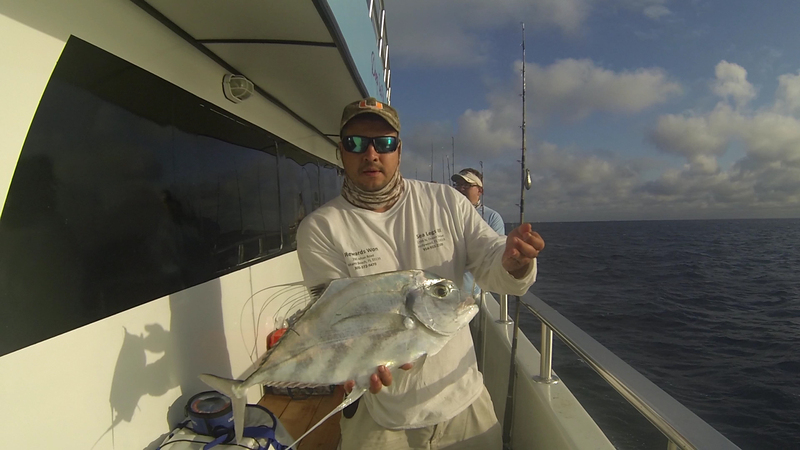 Here is my small Blackfin Tuna, it was so greedy that it swiped a jig half it’s size. 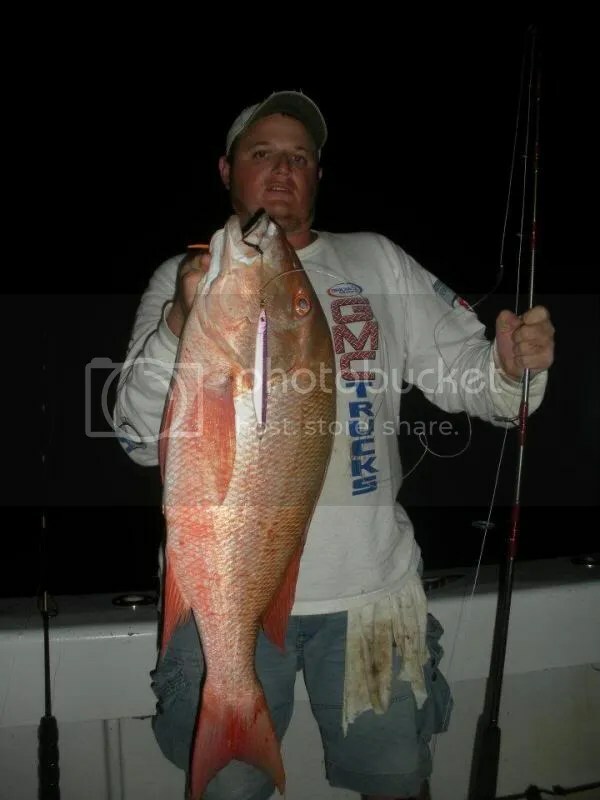 As the day went by a few yellow eye snapper, sand tiles, and a rare Long Tail Bass was caught by Jeff another experienced slow pitch fisherman. 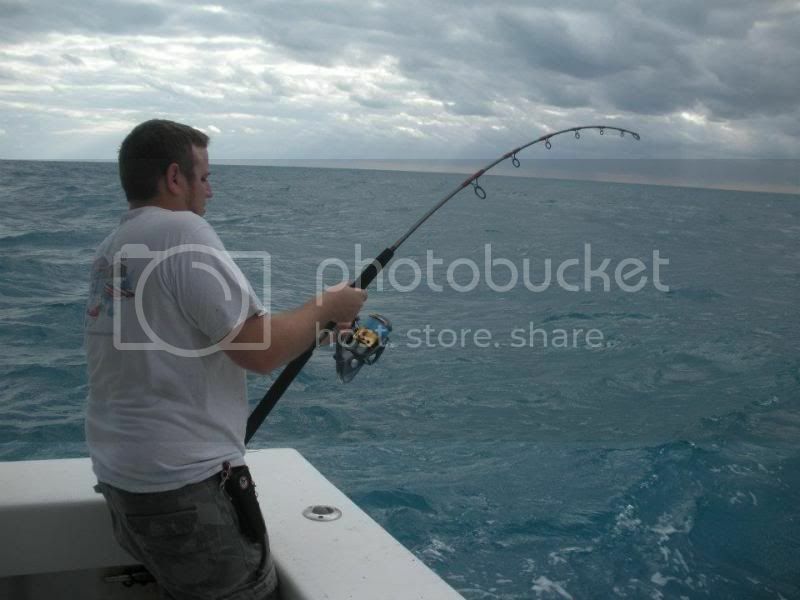 I should have taken a picture but I was busy fishing, sorry guys, I was trying to maximize my fishing time. 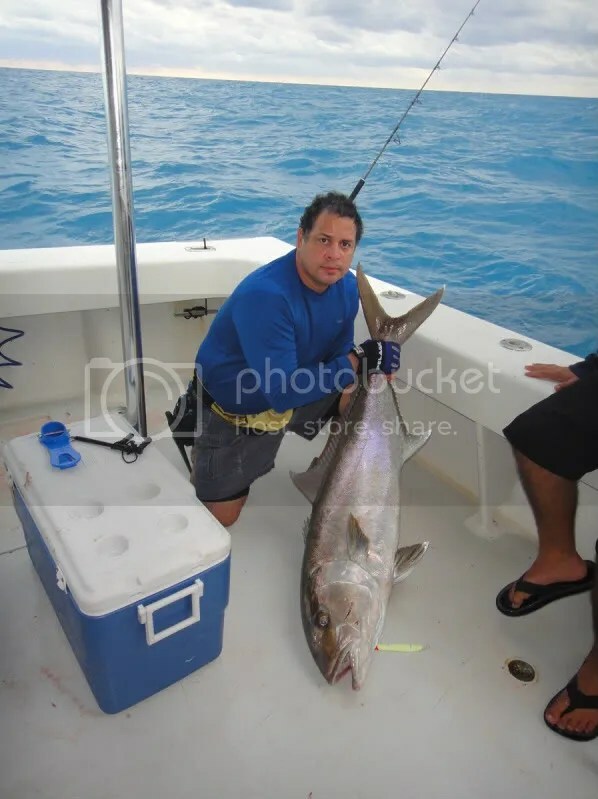 On the deeper end of the trip we fished down to 500 feet of water where Will caught a nice keeper Amberjack. I was still fishing with my prototype slow pitch setup and Shark Fishing Jigs when I hooked up a Snowy Grouper and then sent my 500 gram slow pitch jig down again and hooked a Yellow Edge grouper. 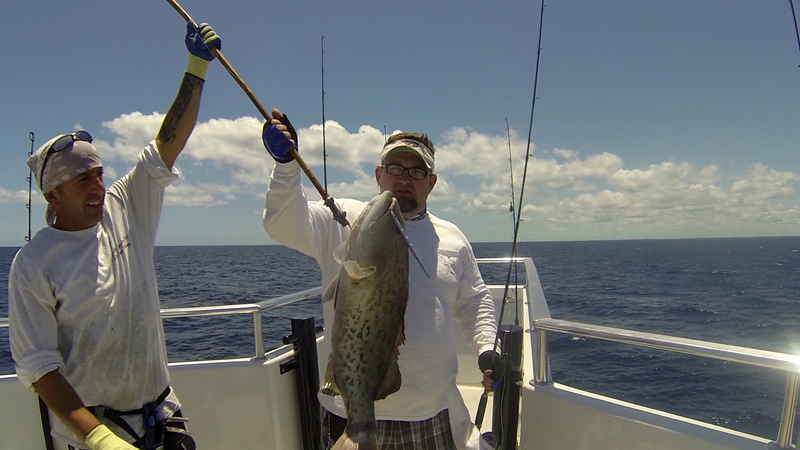 What are the odds, the only two keeper groupers caught were back to back on my setup. 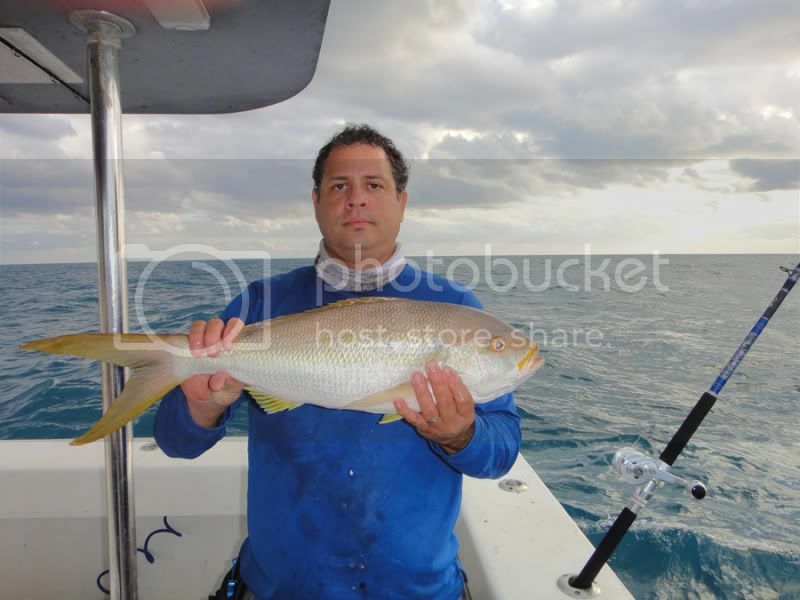 Below is the Snowy Grouper and the the Yellow Edge. 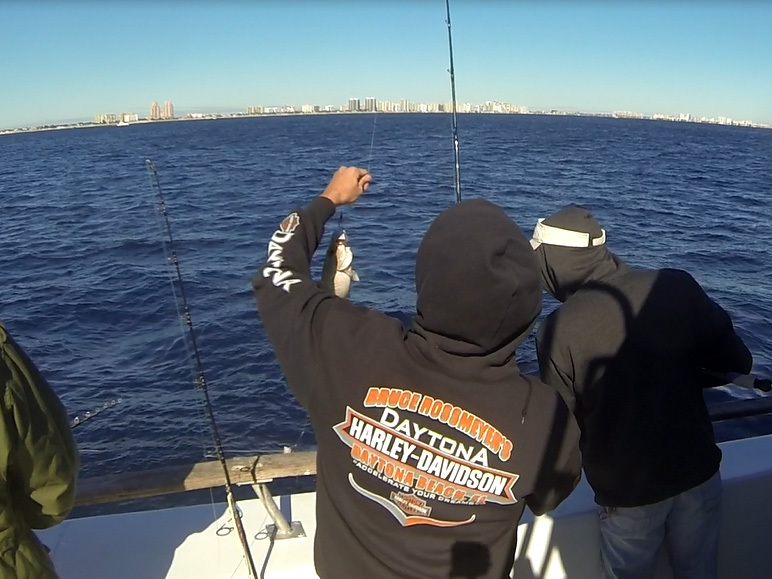 The highlight of the day came when Jared hooked up with a Sailfish on a jig. 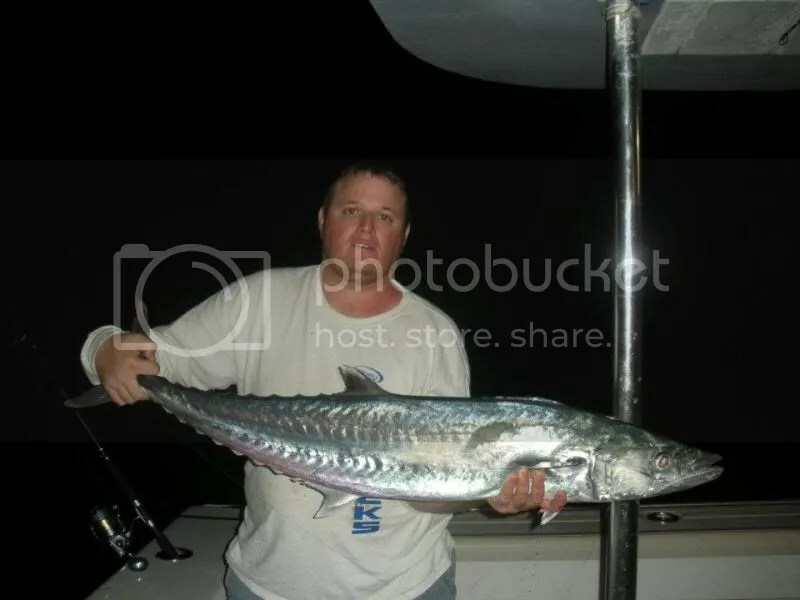 He fought it for 30 minutes going around the boat 2 times until he got it close enough to touch the leader and made it an official catch. 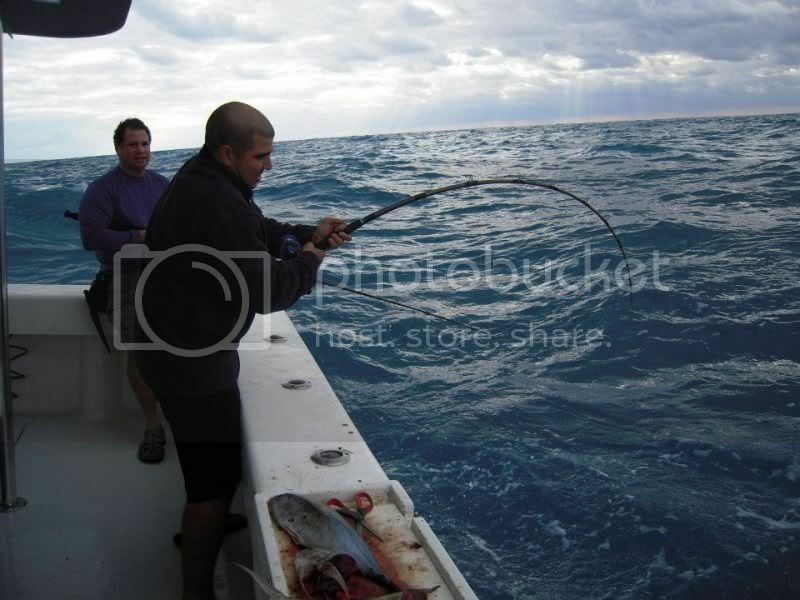 The jig was extracted using a gaff and the fish was released. High fives went around and the fish swam away to live another day. 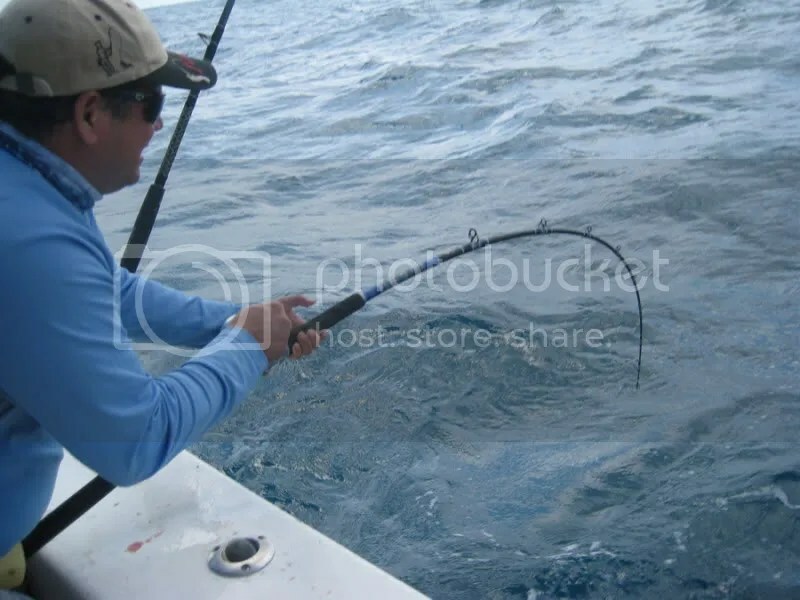 Below is Jared fighting the fish and also a pic of the Sailfish with the jig on it’s mouth. Below is a video of part of the fight. All in all it was a good trip and plenty fun was had. 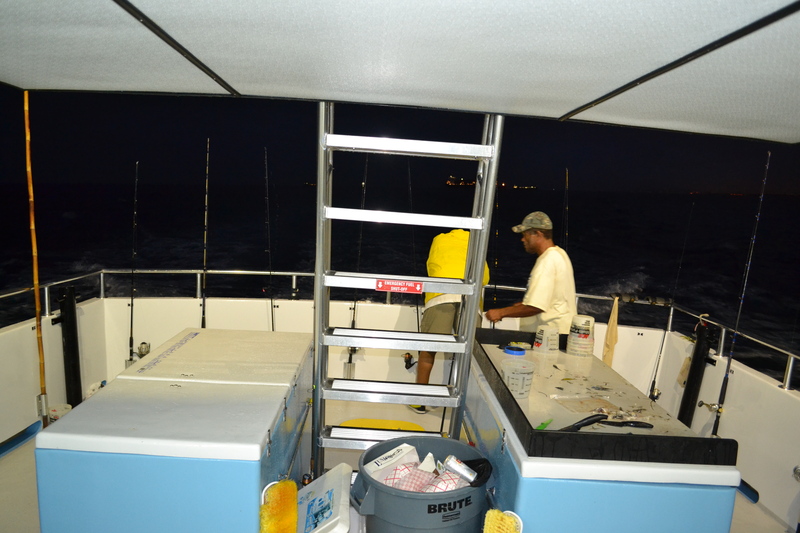 We left with a full boat’s fish cooler. 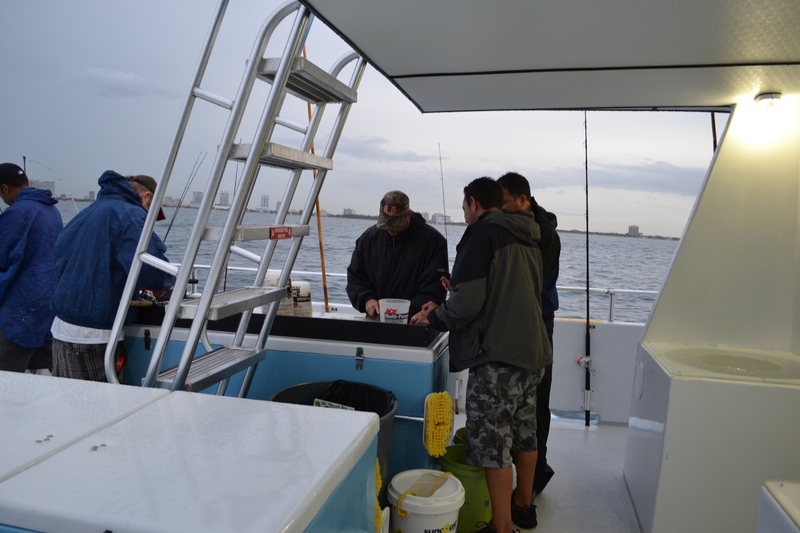 Back at the Bayside Marina Docks the fish were unloaded and the mates cleaned the fish for those that wanted that service. 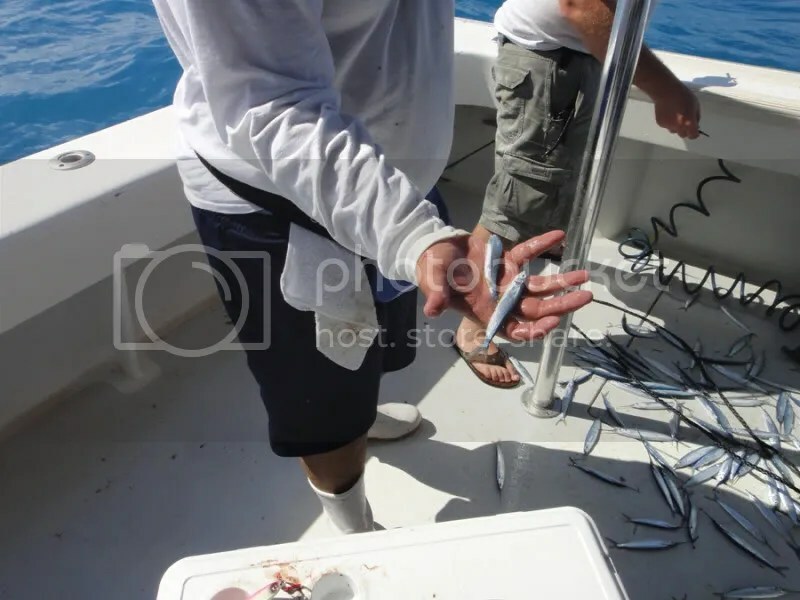 Below is the mate sorting and giving the fish to the fishermen. 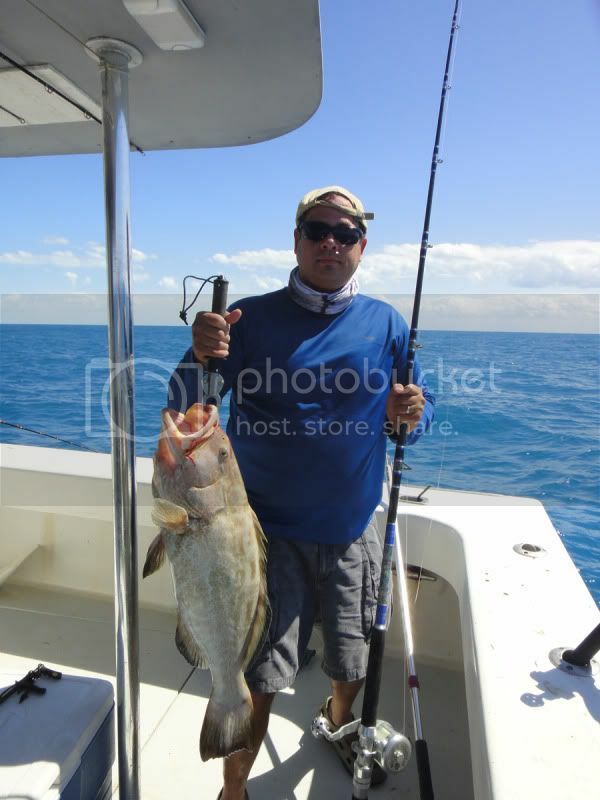 Below is a fisherman that was using bait and tried out vertical jigging. 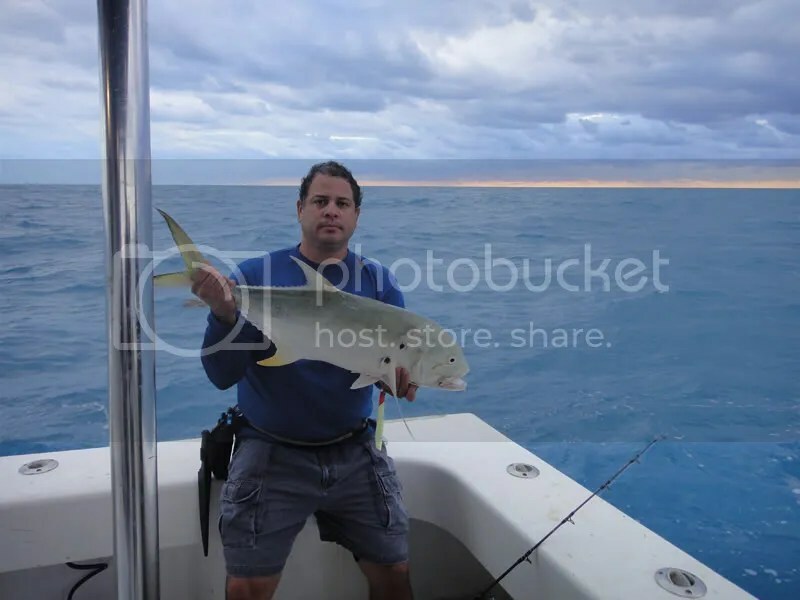 He caught dinner and wanted a picture for him to later retrieve from the web. So here you are Sir. You are welcome to download your own picture, enjoy your fresh fish dinners. Just click on the picture to make it bigger, right click on it and save it to your PC or phone. 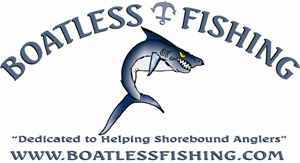 Happy New Year to you all and Happy Fishing in 2016. thanks again for visiting my site. In order to reach the bottom use 1 gram weight per foot of water (if fishing in 300 feet of water use a 300 gram jig), if the current is stronger adjust accordingly by using a heavier jig. It works the same way for Slow Pitch Jigging. If of any interest to you I was using a 60 to 400 gram Slow Pitch Jigging Rod, a Shimano Ocea Jigger 2000 with high speed gear 6.1:1 loaded with 30 lb test braid line, 40lb test fluorocarbon leader, and 3/0 size hooks with 2mm length assist cord. 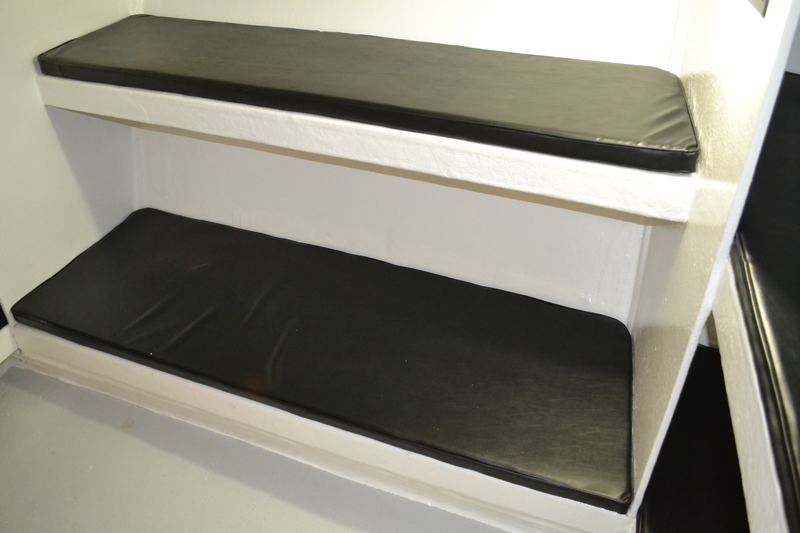 two hooks on top and two hooks on bottom. It felt wonderful to fish once again and be able to actually do so. Last few trips were plagued with engine trouble. 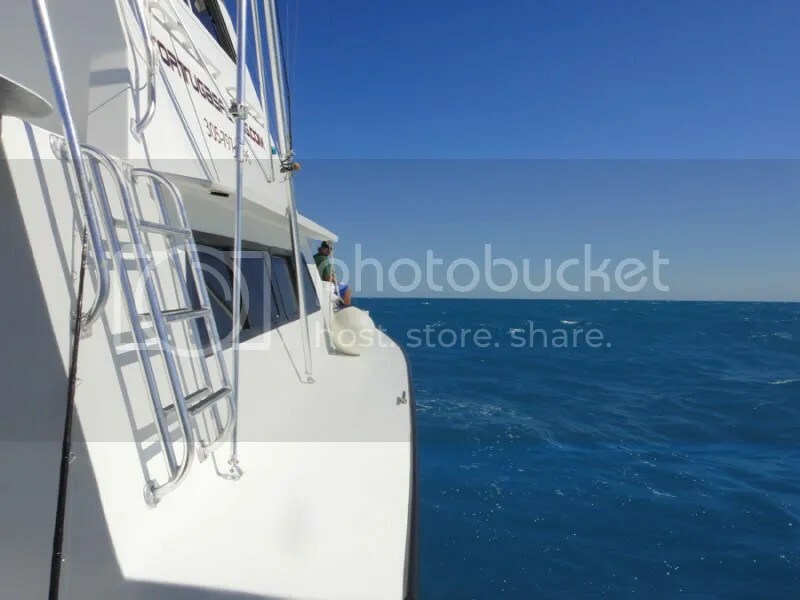 This trip was out of no where, some of us have been too busy with our lives to be able to fish together so emails flew and we decided to just chill on a six pack boat for 4 hours but ended going on the Sealegs III since we heard it was back on the water after being newly refurbished. 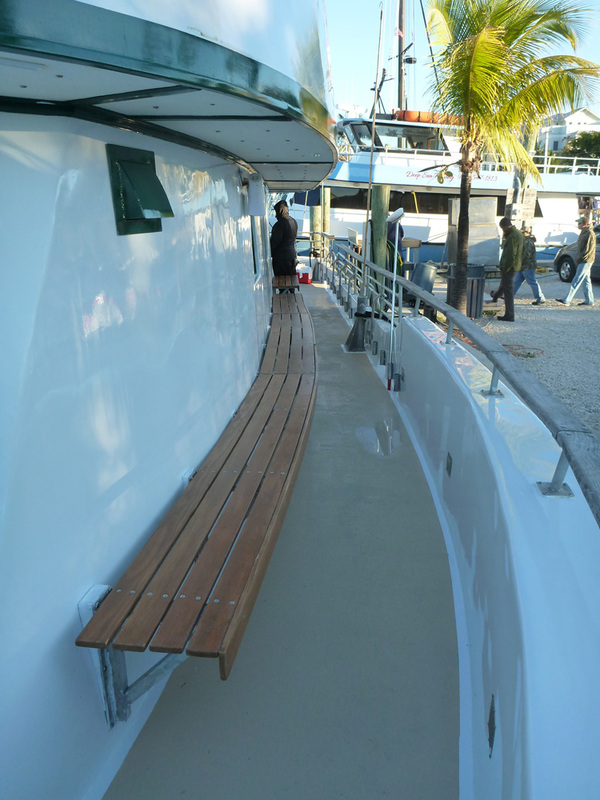 The boat looks like new just like the Out Of Control IV which is another boat that was refurbished last year. 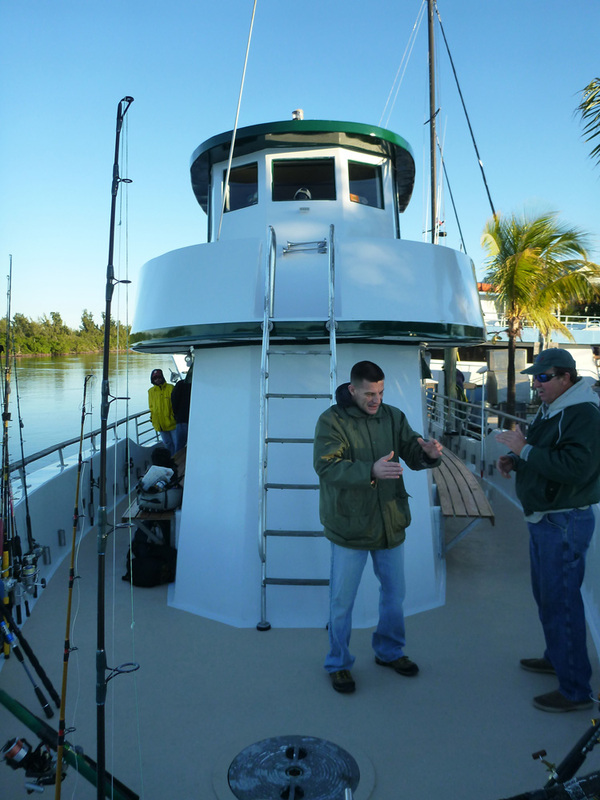 After speaking with Captain Ralph he gave me the news that the Out Of Control IV will be moving to the West Coast to possibly do Tortugas trips as well as fish the towers and wrecks in it’s surrounding, I know there is quality fishing in those areas I would definitely be interested to do a few trips to those towers, I sure miss fishing them. 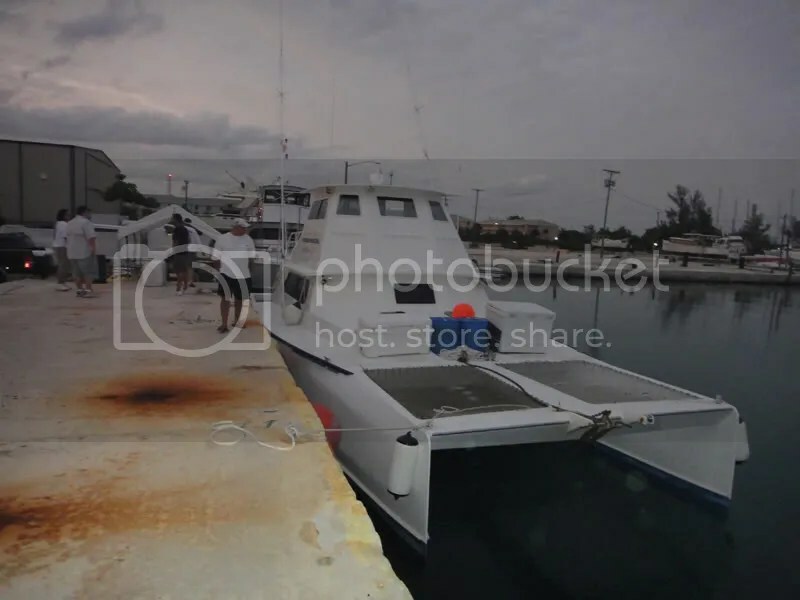 Another news Ralph gave me is that his father Captain Kenny would probably be retiring and would captain the boat on a part time basis plus a fish market was in the works since he has just purchased the marina. 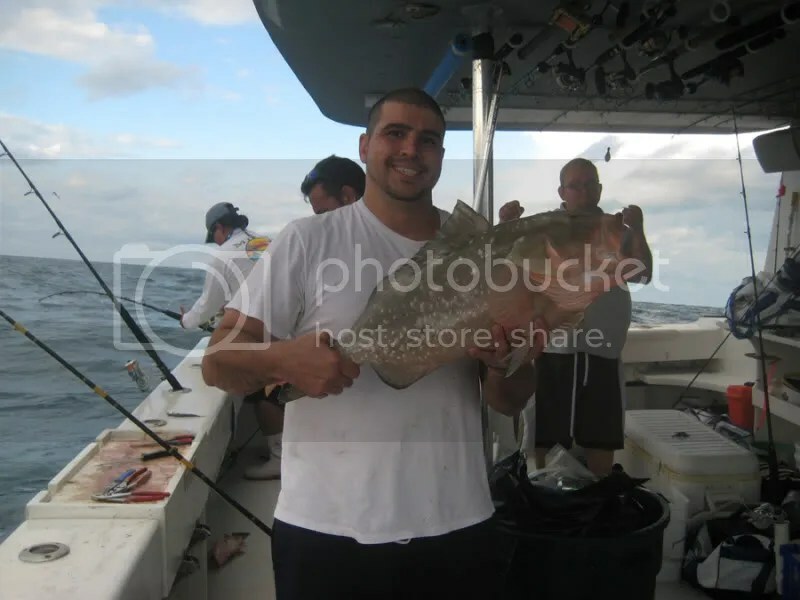 The trip was a regular 4 hour trip we knew jigging was a possibility and we did try I got a nice hit but that was it. 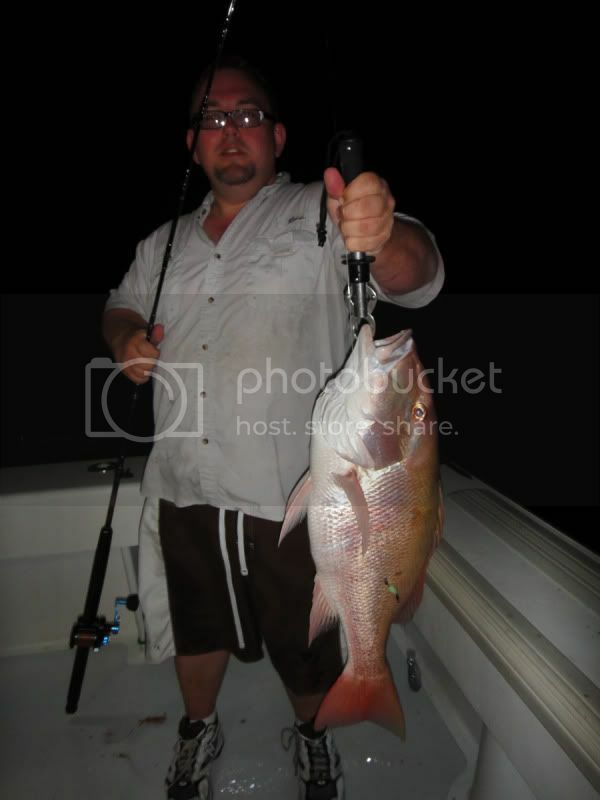 I kept at it until 10:30 when I switched to bait as Russ landed a nice porgy that won the pool, then it was John’s turn at a nice vermillion snapper (beeliner in some other areas), and after came Nilson with an even nicer Vermillion, after that we moved and it was my turn at a nice Vermillion we call nice a vermi that we can hold with two hands since in these areas the usual size is barely pass the legal size. 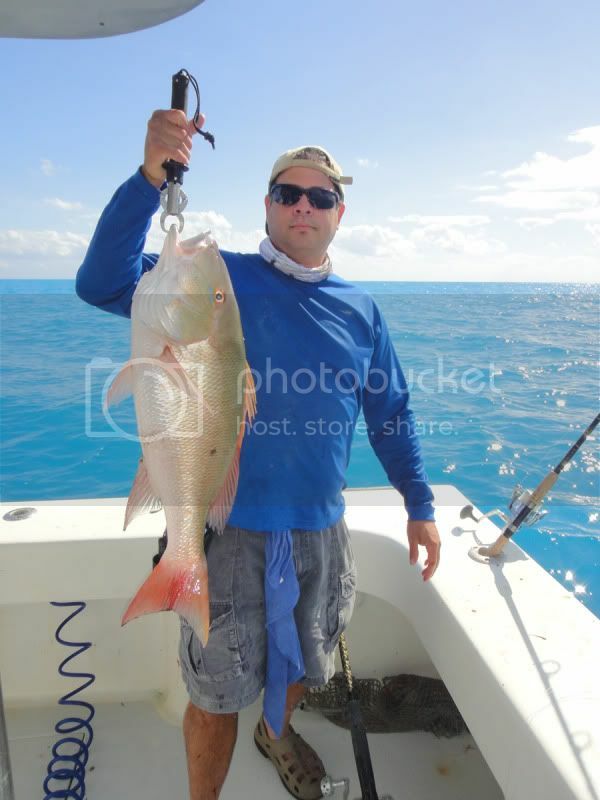 Then Nilson got a lesser amberjack and many i the boat where landing triggerfish, lane snappers, and more porgies. 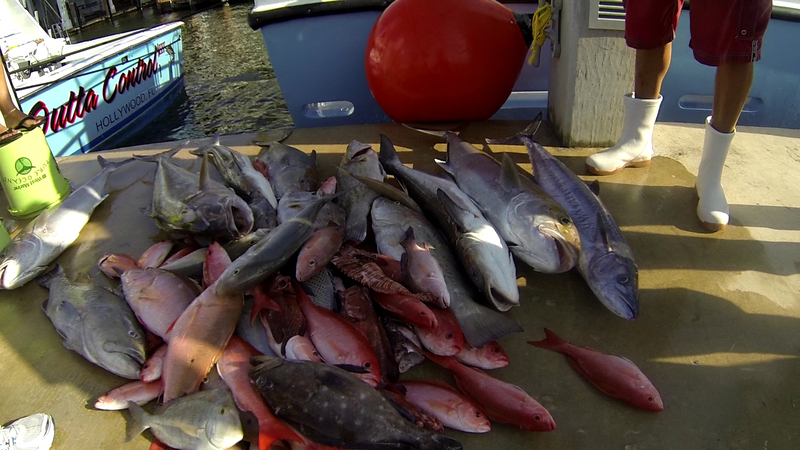 Not everyone got to keep fish as many had to be thrown back in, but a nice amount of fish was caught and kept. Well enough of the talk, here are some pics. 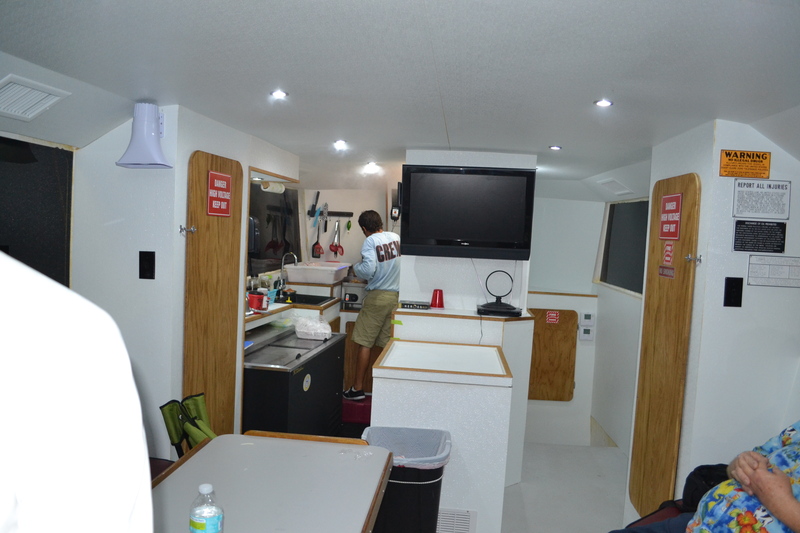 Waiting to go fishing while looking at the new paint. 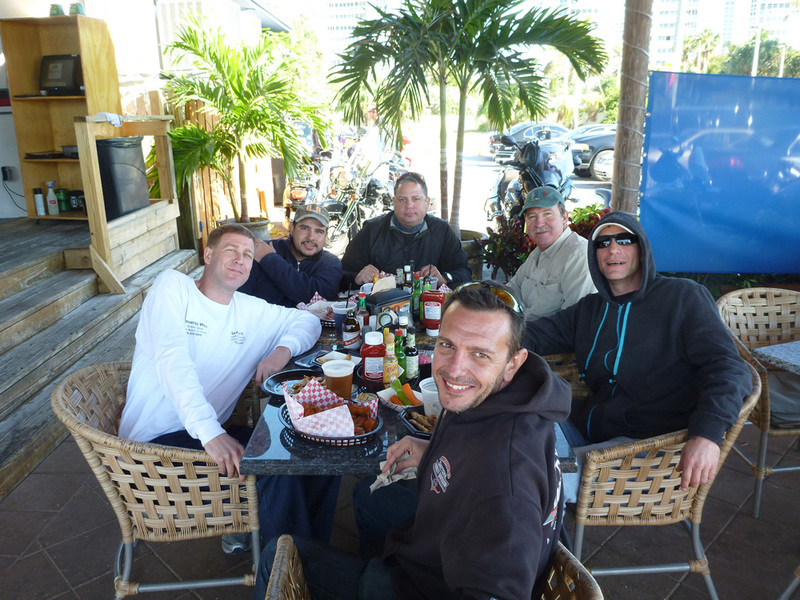 After the fishing was over we had a nice lunch at the Sandbar Restaurant a few blocks away from the Sealegs III. It was nice to fish with old friends again. 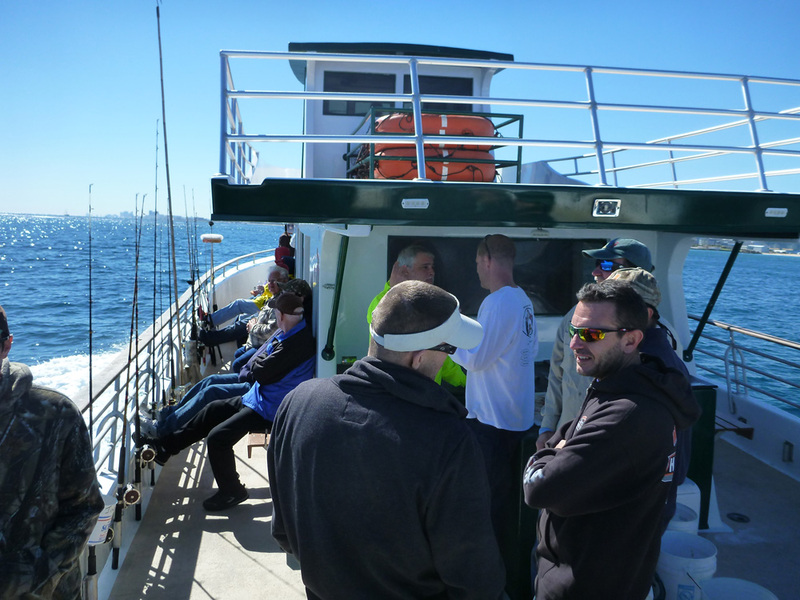 The Sealegs III will have an all day jigging trip on February 2nd the cost is $125 and includes tip, but we wont be able to make it so we scheduled a trip later in February. Here is part of the report and story as I remember it. 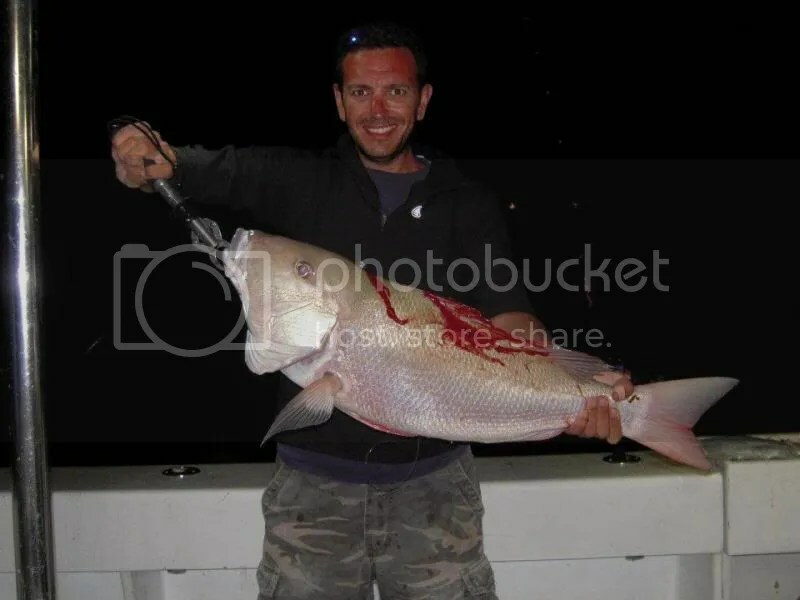 Since it was constant fishing, short resting periods, lots of rigging, plenty bait cutting, etc… the order of the events may have changed in my mind. 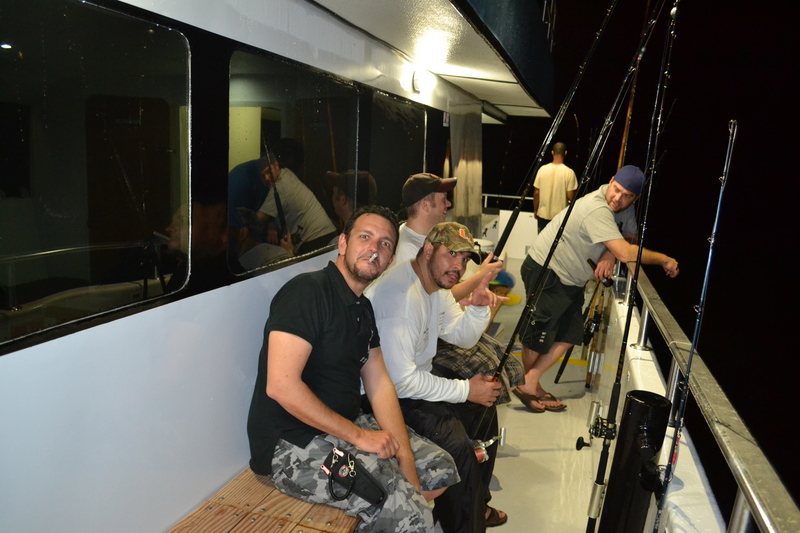 I also tried to see what everyone in this trip was experiencing but focused a lot more on my fishing. Jigs : Knife Jigs 100-250 gram, Diamond jigs 100 gram, Red hawks jgs…Pink, red/white, silver, and blue worked the most. 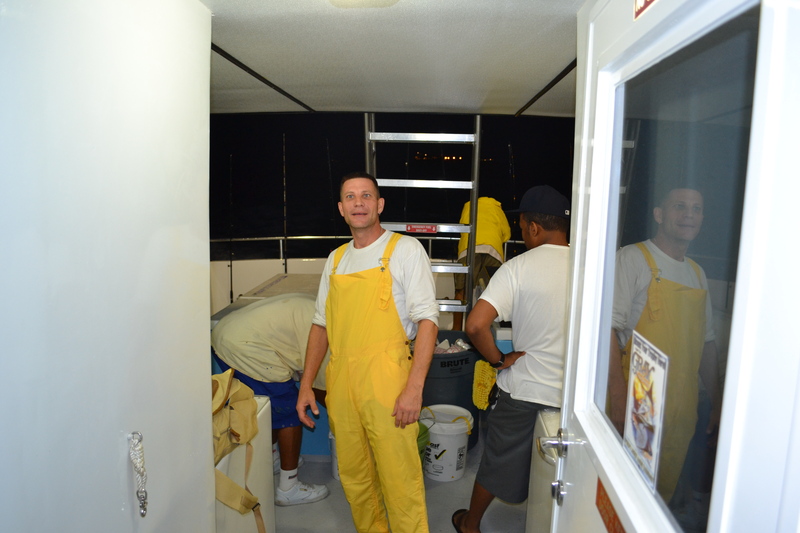 THE PLANNING: After many emails and PM’s a year ago we decided to take one of those famous Tortugas fishing trips with Captain Yuri. It took many emails throughout the year to get in accord as to what gear we were all going to bring and some got together to order lead and vertical jigs so we could get discounts. 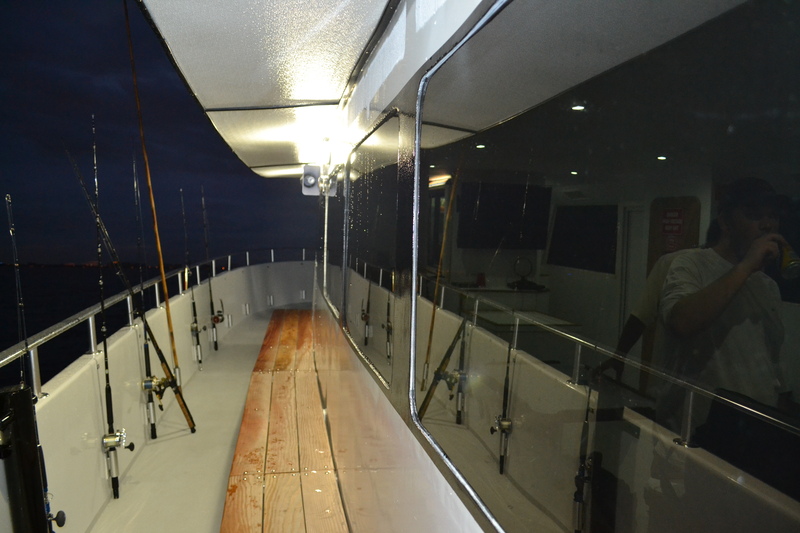 Rods were made, reels were bought, and many lists came and went. We picked a moon that would not create so much pull and would result in weaker currents. We hit the jackpot as the current was minimal. CLOSE CALL TO A NO GO: As many know that week almost got thrashed by a developing low pressure system that canceled many other trips on different boats, but fortunately for us a mild cold slowed down the low down and in the words of Captain Greg “it stabilized itself”. I think we almost became mini meteorologists, and oceanographers, LOL…. The good thing is that the bad weather created a nice environment for a feeding frenzy (so we think). The ocean was a bit dirty from the previous low pressure system and passing weak cold front. What a great time to fish! 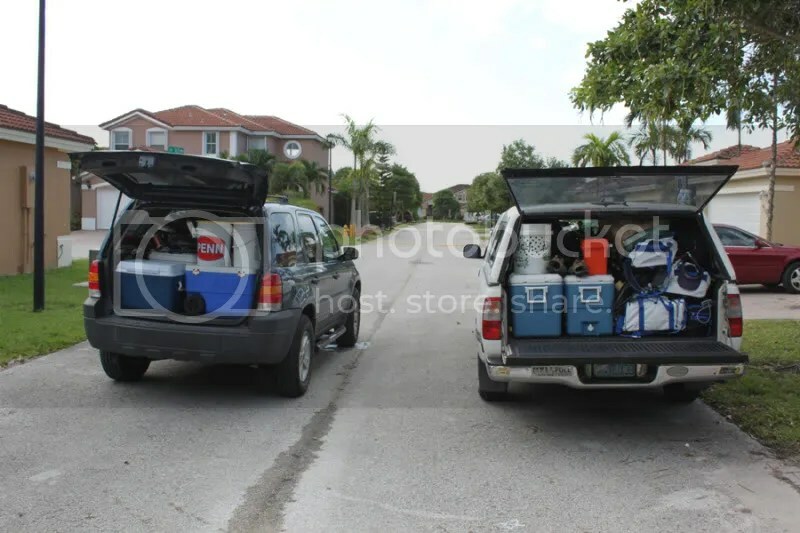 Getting ready and loaded to the max. 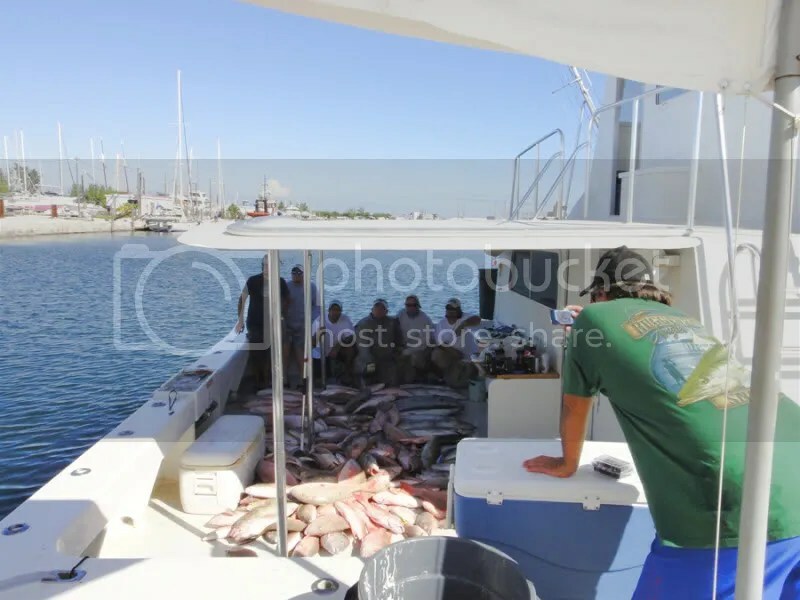 THE BAIT: It was known that it is imperative that we take all kinds of oily baits to the Dry Tortugas but it was pretty hard to gather bait before the trip, at times we all tried to go out at some point and got drenched in water doing so. We collected a few runners, macks, and jacks. 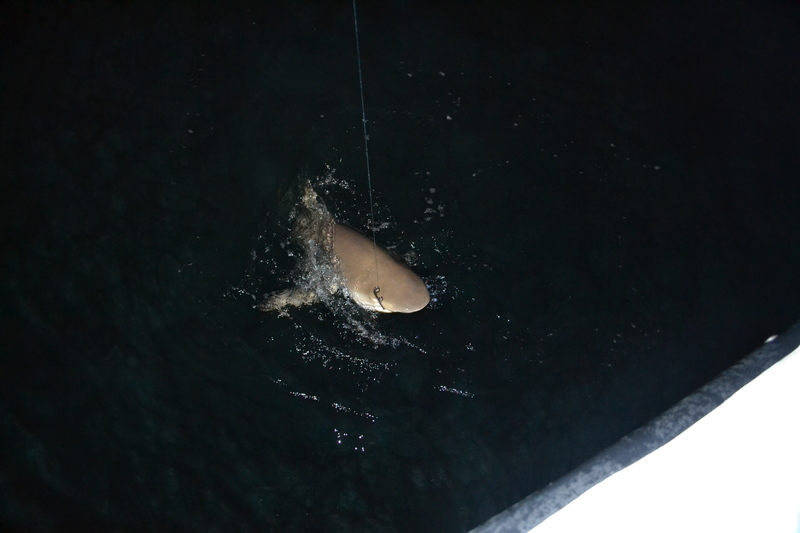 We decided to stop trying and to catch bait on the day of the trip. On the way up we did the norm, stopped at Jacks and got some fresh ballyhoos and some threadfins (in case we went to a wreck), we then passed by the Yellow Bait house in hopes for some frozen gogs but they had none, we passes by Atlantic fisheries and loaded on fish dip and slab of frozen gogs (BINGO! They had them!). 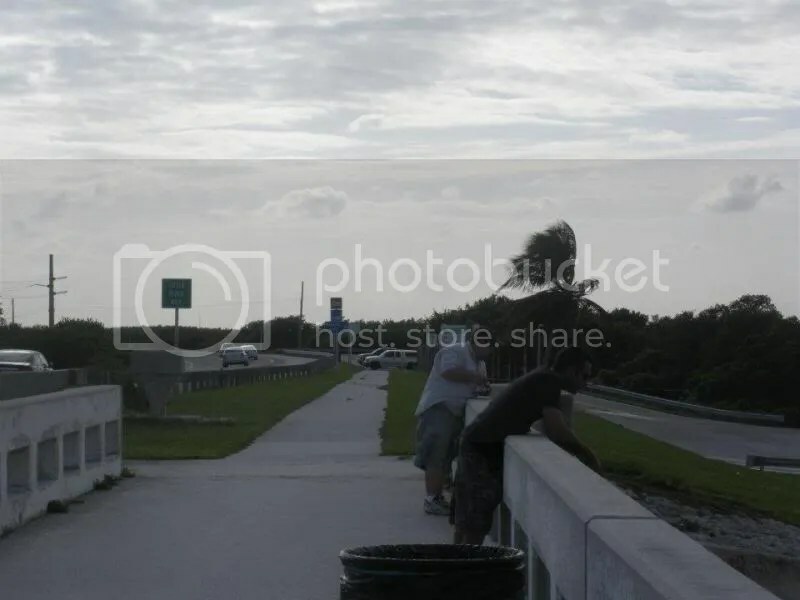 We tried for cudas and other baits at channel 2 but these were on the other side of the driving bridge so we moved on, we passed by 7 mile bridge and found nothing there. We then went to get some pins that “SOMEONE” though was useless but I insisted and they caved in. 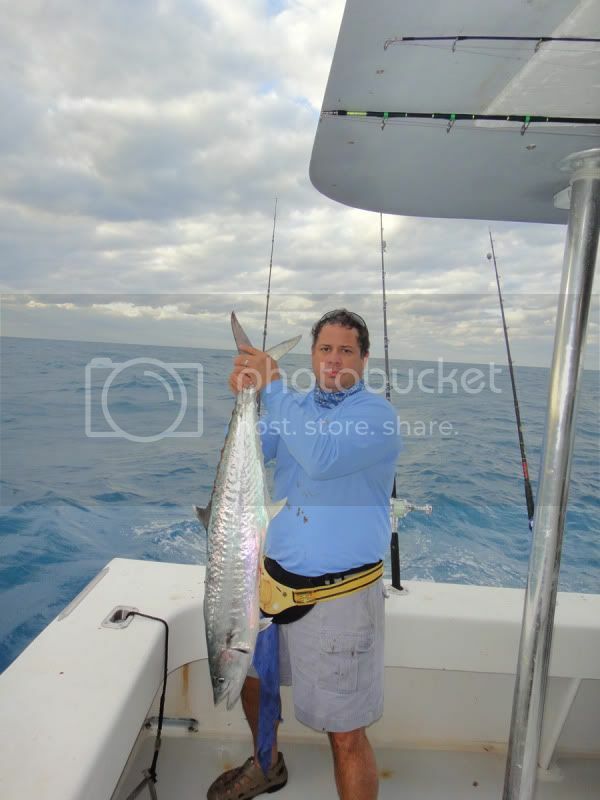 After Rory netted the pins and Ricky, Nelson, and myself got a few of the bigger ones (Rob was the vigilante taking care of our gear), Rory got some sardines that were in the mix and Rory said “why not throw another cast?”. And so he did and got some more. We took the white bait just in case. 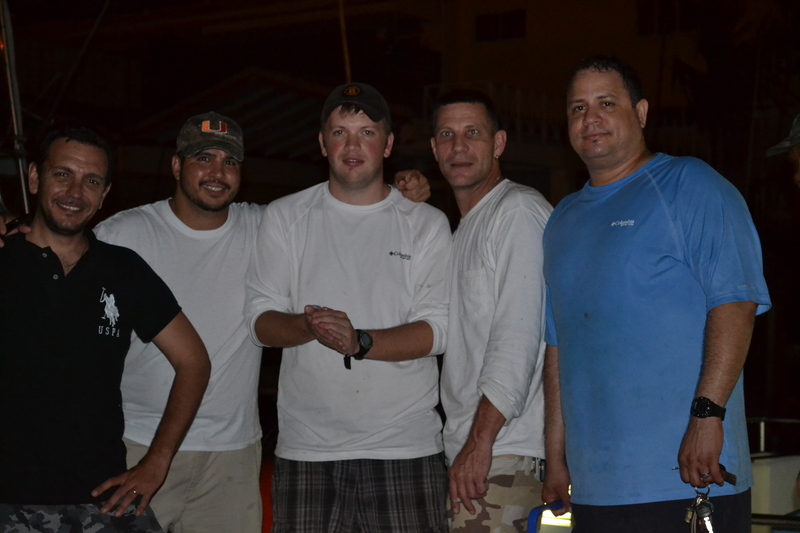 We were more confident and went to the boat and met Jorge, kewl guy. 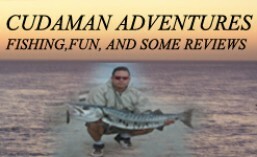 Nice to meet you and fish with you man. 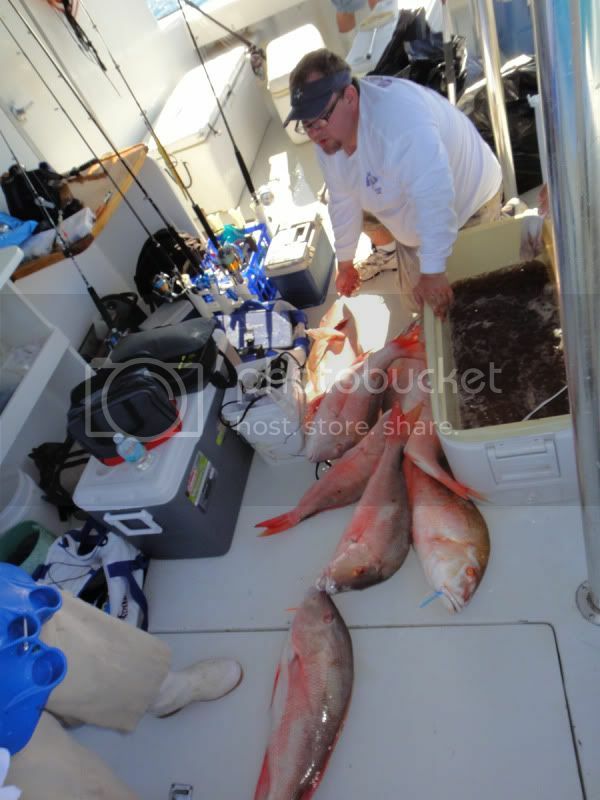 FISHING STARTED: All we needed was 3 ounces to get to the bottom but I chose 5 ounces for my mutton rod and 8 ounces for my grouper rods to be used with large baits ( I did target them on every stop). Others chose 6 ounces and even 8 ounces to get to the bottom quicker. 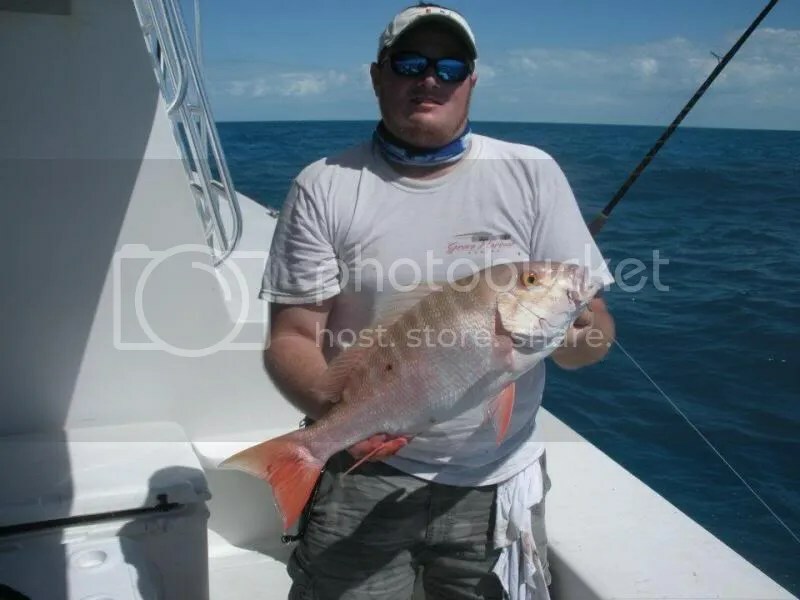 Since the water was murky I stuck with 50lb leader most of the time and when the bite slowed down or the fish got bigger and the sun was out I switched to 50 pound fluorocarbon at times switching to 40 pound leader. After the water was chummed up the muttons started chewing within an hour of us being there. The bite was great from the get go. 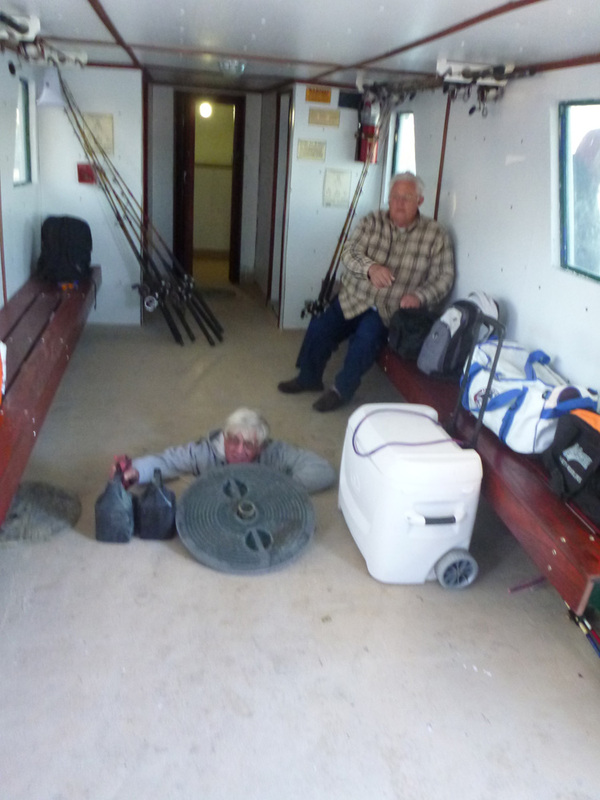 Two of the crew went to bed while the rest continued fishing. 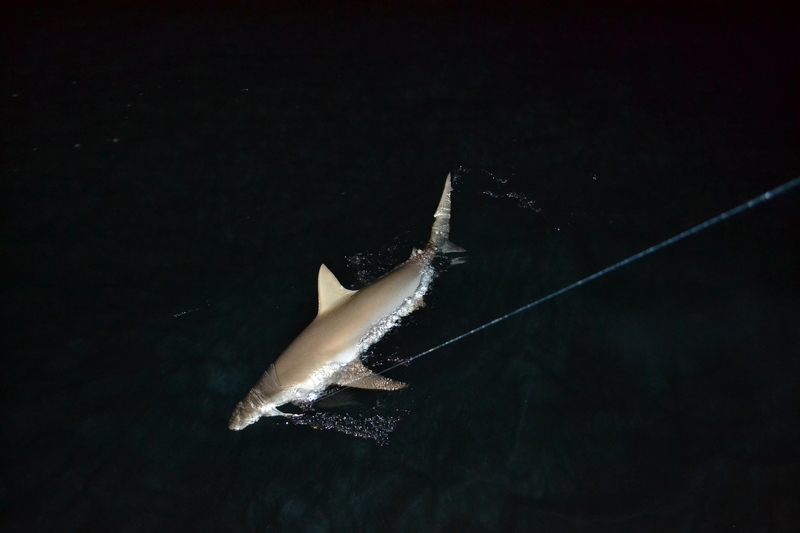 The first night was all about the muttons while a few sharks came by and collected their Tortugas tax. 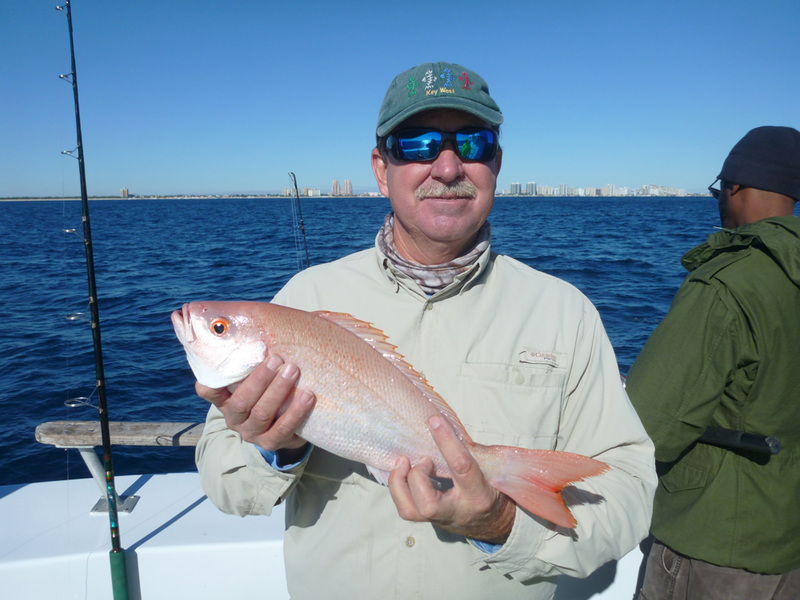 We started with a variety of baits pinfish, cut blue runners, and George had fresh gogs that he used and kindly shared some with us. We caught some muffins and some decent pinks but the bite slowed down. I then took out my little spinner with a 60 gram vertical jig and got a blue runner so George and I cut it and got more decent size pinkies with the strips we cut. So we kept every blue runner we caught after that. 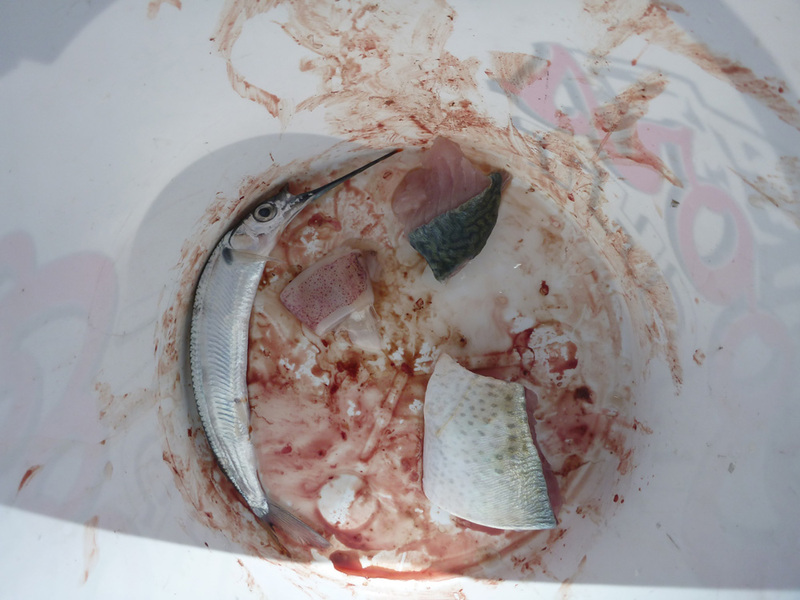 Other baits were used and just about everything that hit the water got chewed on. 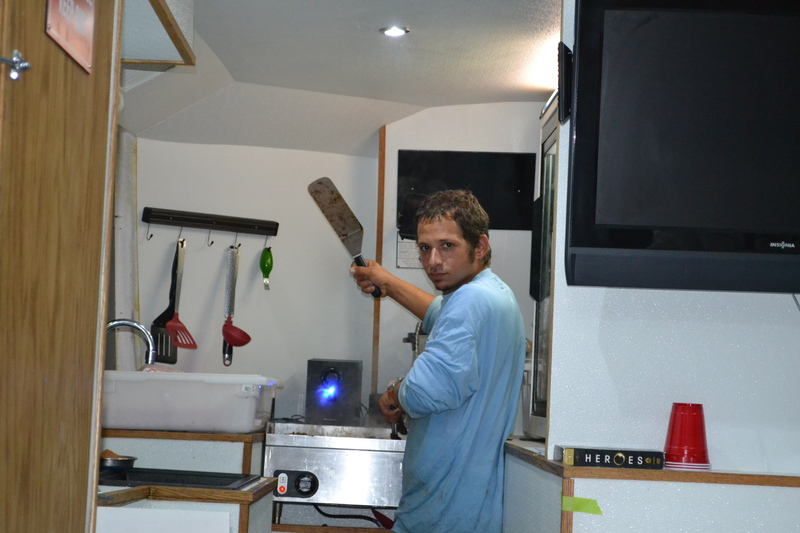 Also I think Rob tried the Lucanos and Jorge tried the Aki jig for a bit. The yellow tails were very aggressive and so we got many of them most were over 20 inches. I got one that was 26 inches (5 pounds), so I kept it. 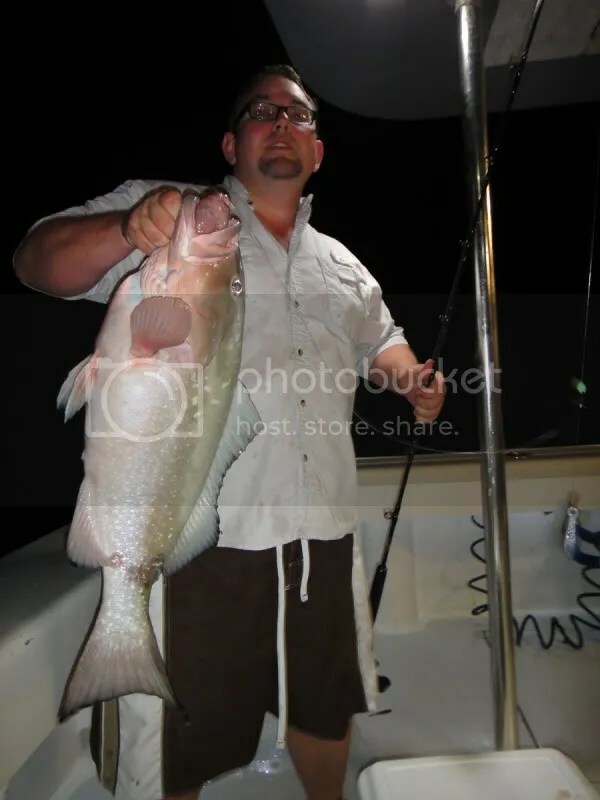 THE VERTICAL JIGGING GOT STARTED: Early morning. 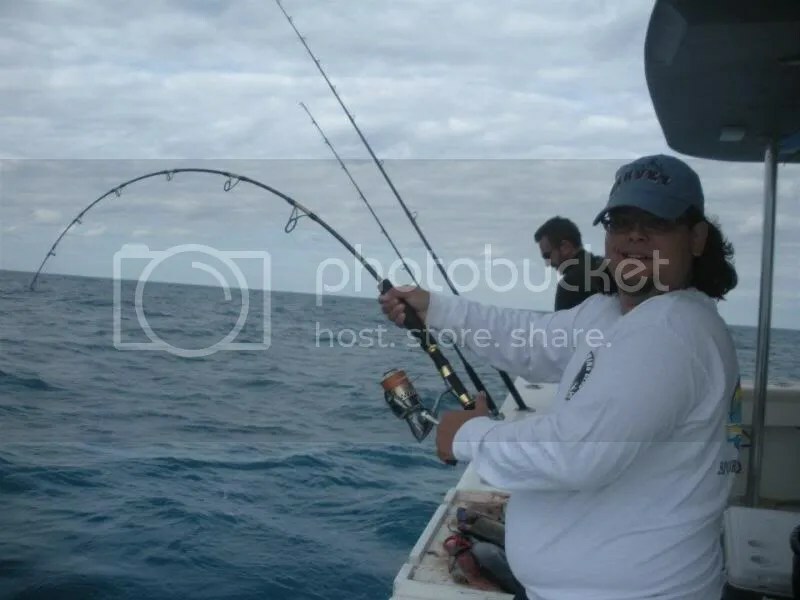 I started jigging and got a football sized blackfin tuna, then came a couple of jack crevalles, and I had a nice fight on the Saltist 4500 I tighten the drag all the way and the hook pulled. Jorge started jigging as well and ended with another nice jack crevalle that was released. (We only kept one for bait). 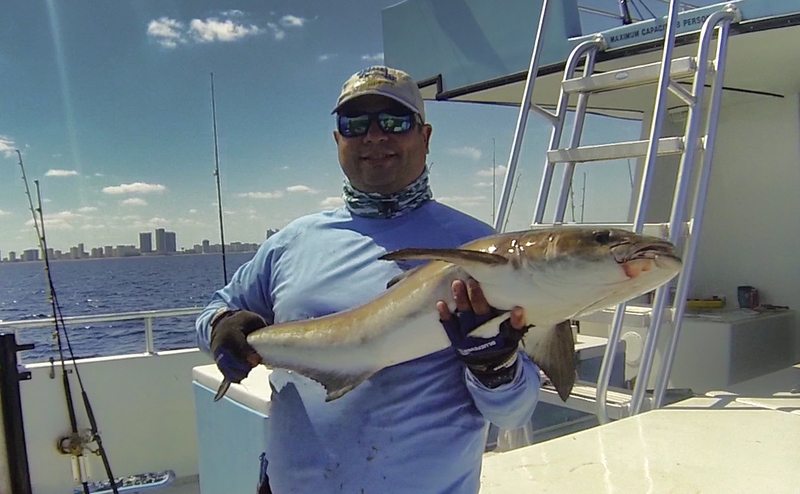 I then tried again with the looser drag (about 18 pounds), and then the trouble maker got hooked, SEA DONKEY! Rory and I were on. I spent quiet a while to pull mines in and Rory pulled his sea donkey in a bit easier since he had that huge 18K. 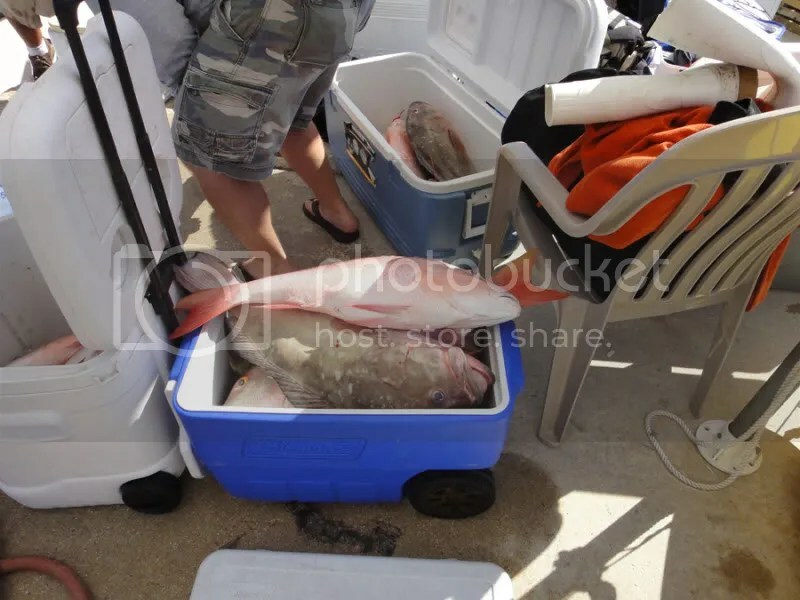 We did not want to waste space in the cooler because we saw that the bite was kind of hot on the muttons. And each of those donkeys filled a 150 quart cooler with no problem. After the donkeys the bite slowed down and we moved to another spot. 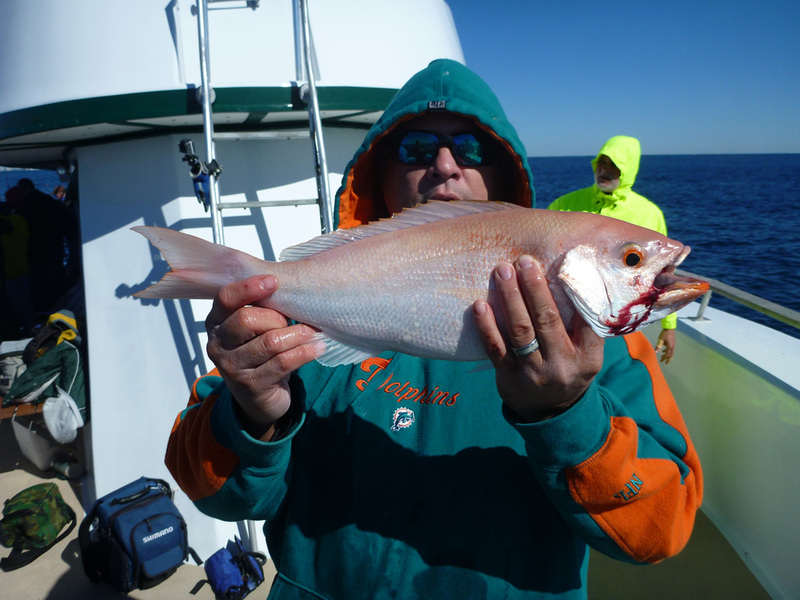 Rob got hooked on the Lucanos a few time the aki jig did not. 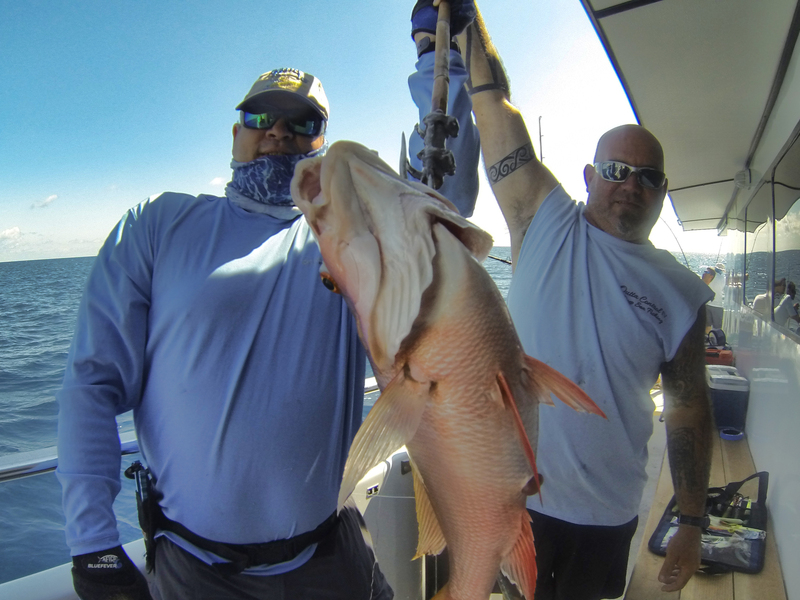 The rest of the day was red groupers on live and butterflied “PINFISH” and we also got some nice flag yellow tails. I believe that Rob and Rory were using the white bait for those. 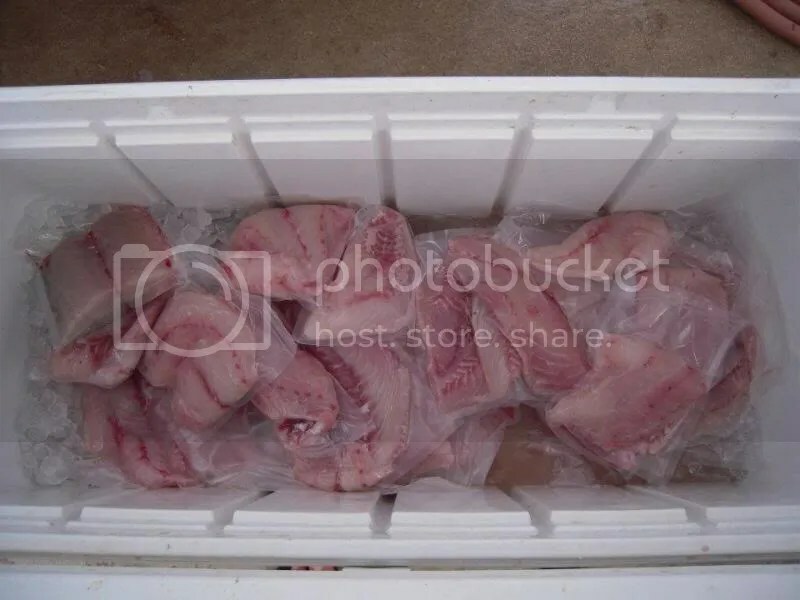 We looked for the box of squid but could not find it, then realized we left it in one of the trucks. Jorge, Rob, Rory, and Ricky jigged the most. 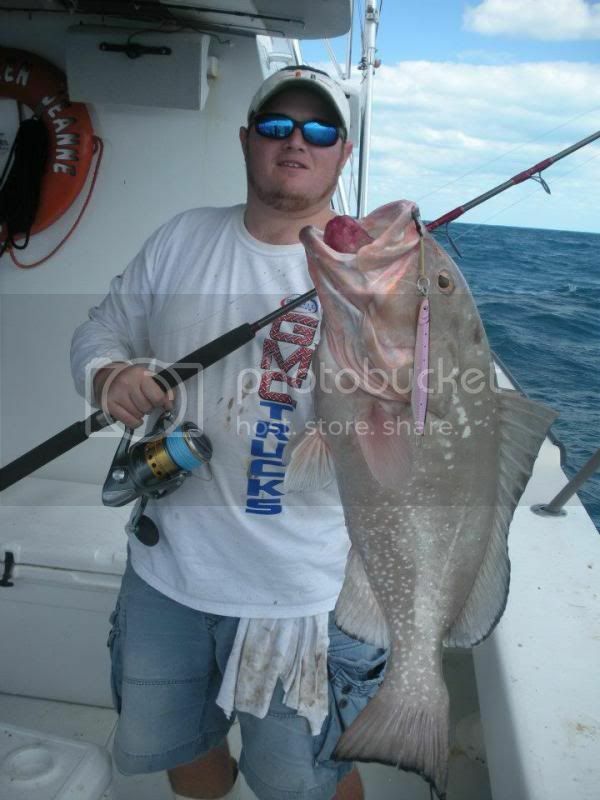 They pick a few nice and some short muttons and groupers. 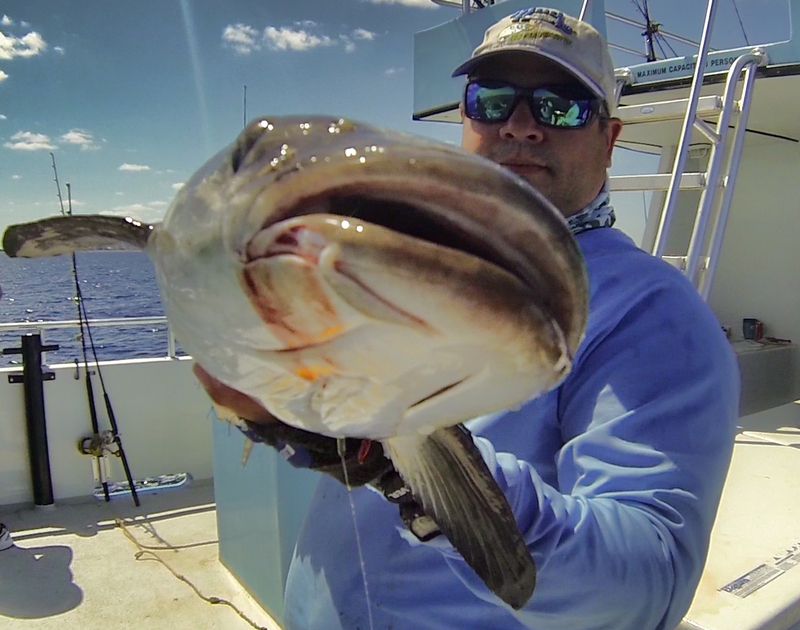 I only jigged when the bite slowed down. 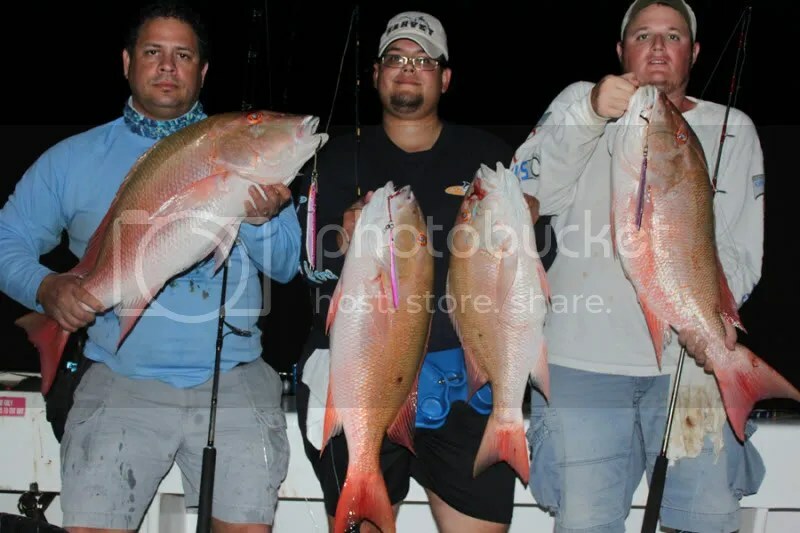 It went by as we continued to try the jigging and baiting until we figured that we need to drop the jigs first before any bait and that was the ticket to some nice groupers and muttons. I got one of the biggest muttons of the trip on a vertical jig while Jorge got another two and Rory got a nice one as well. 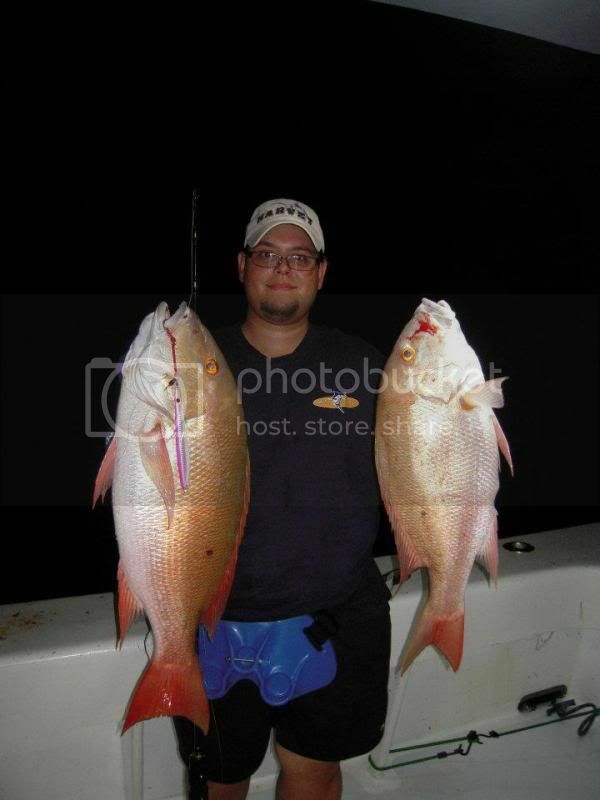 We were taking the pics when Nelson got hit on bait and pulled the other biggest mutton, both were 16.2 pounds on a digital scale. 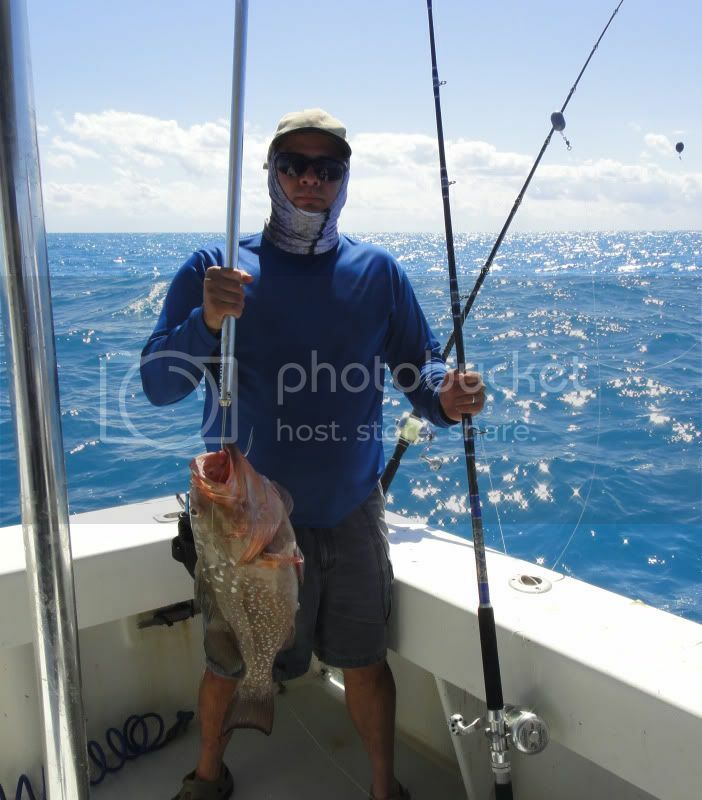 Rob kept on trying the Lucanos with Rick and both got nice red groupers and short ones as well. Rob got a real nice hit but his tiny Lucanos jig hook broke. 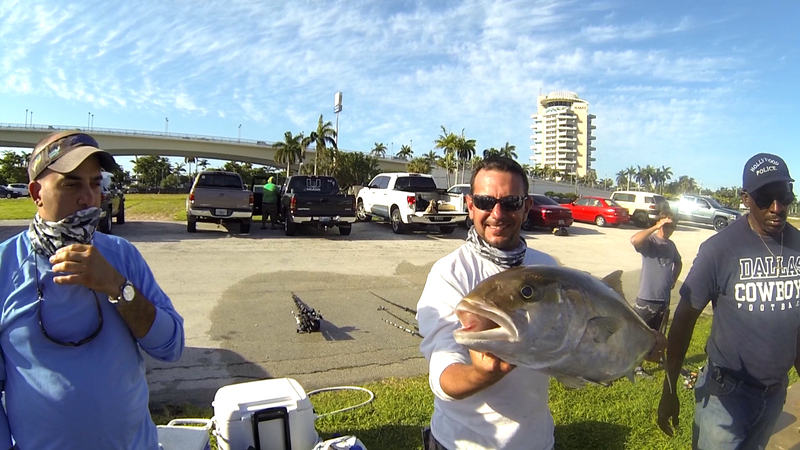 Rory and Jorge continued with other muttons on the jig while I was using bait. We spent the entire day moving from stop to stop and we picked at the fish with the jigs on every first few drops. 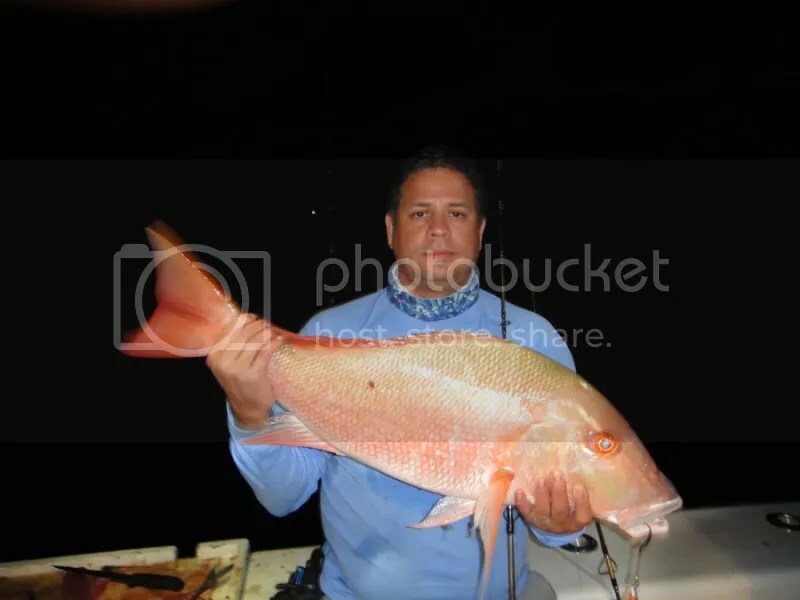 We would run to be the first ones to drop the jigs or bait, we had a small competition to see who got the most muttons and the biggest mutton, LOL….Ricky got creative and found a new secret bait, ended with a nice size pinky and I tried it as well with a much smaller cut bait and it worked. 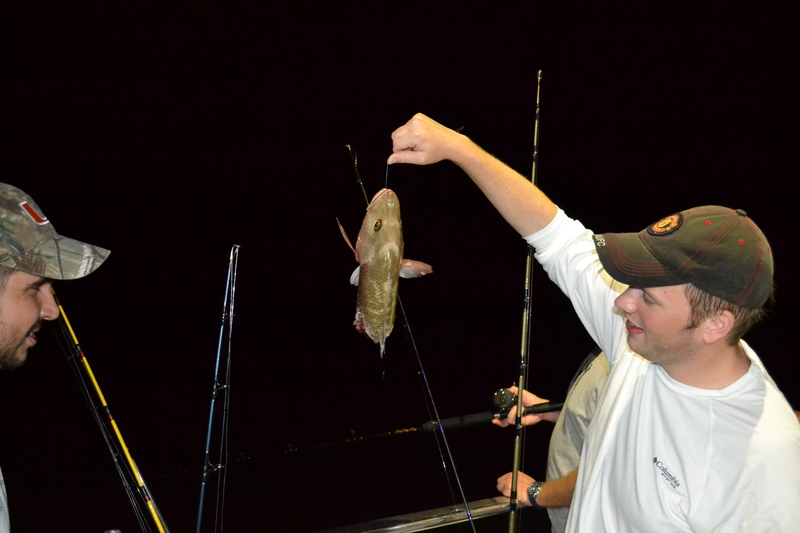 Then Nelson got creative and used a second hand bait that a red grouper had spit and BANG! 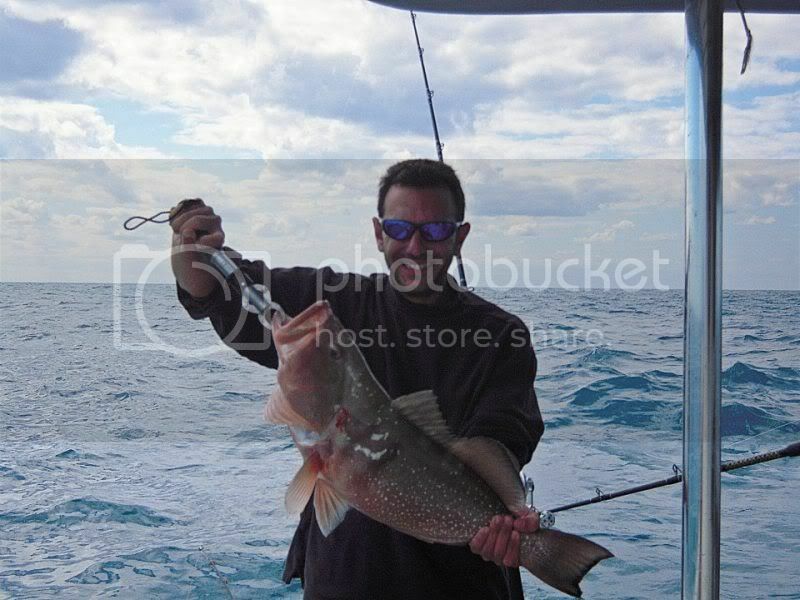 He got hit on it but it was a short red grouper. 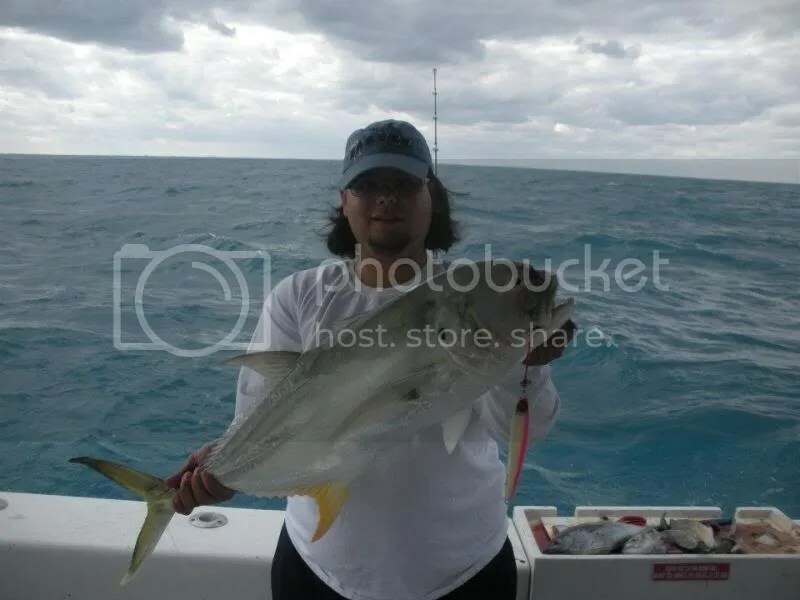 The day went by and Ricky got a nice hit when all of a sudden his line felt like he was pulling dead weight, his nice size black got cut in half by a shark ? 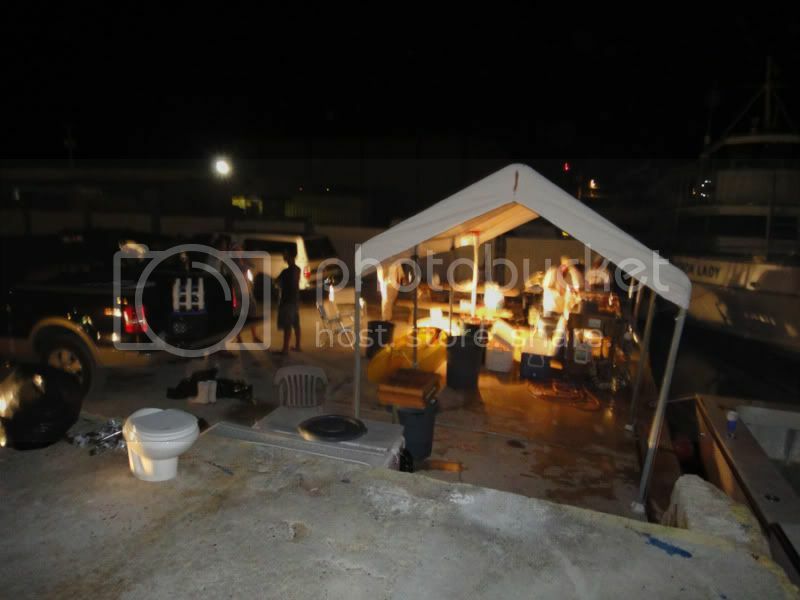 This night we had the famous Yuri fish dinner and let me tell you it was all that people talk abound and then some. It was some great fish. I understand now how Robert started eating fish. Jorge and Rob kept picking at the pinkies while we all slept I between naps. They got some live gogs and played with the kings for a bit. We ended with 3. 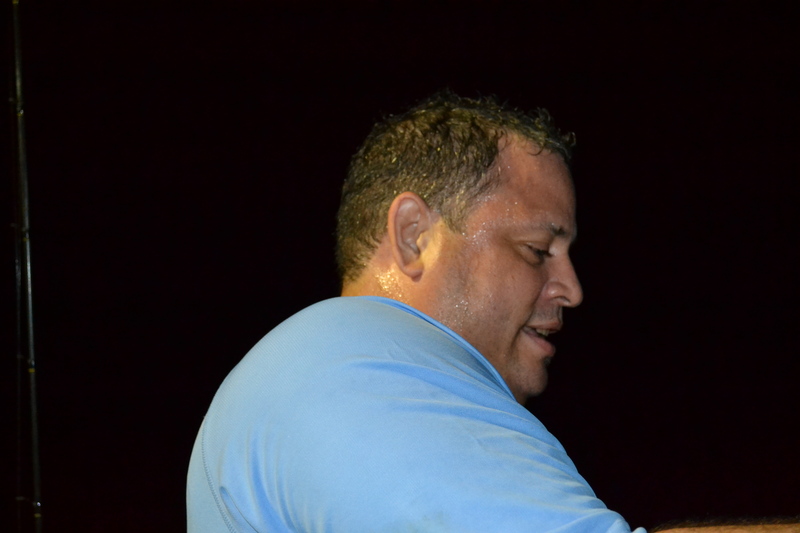 Jorge had a massive hit that he could not stop. I went to be after that. 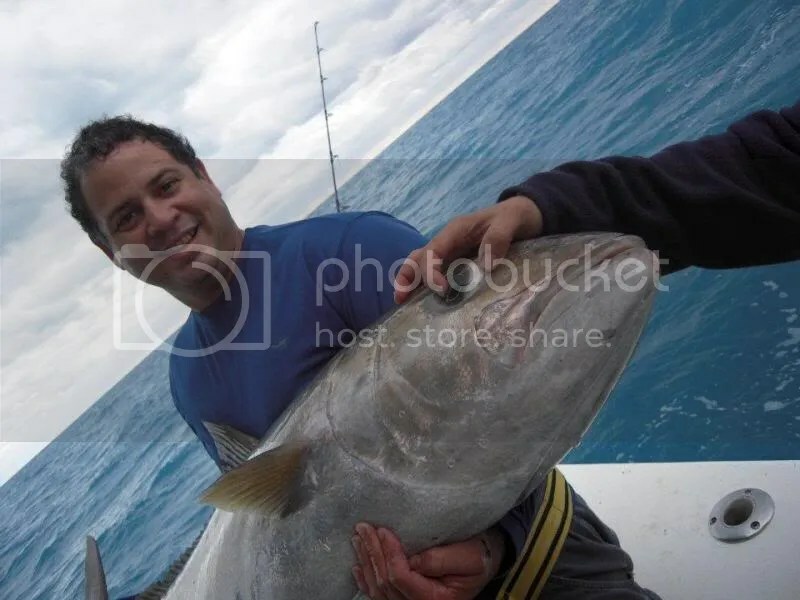 It was the shark and kingfish saga! 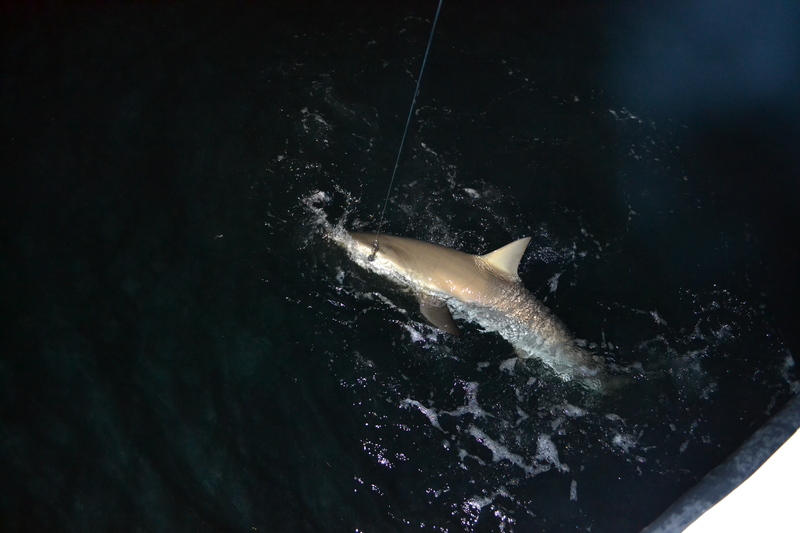 Every mutton or yellow tail would turn into a toothy critter (well it happened all trip long but it was more often as on this day). Nelson was the only one awake all night and he caught up with catching muttons I had a nice black grouper that cost me three tries to get it out of the whole when I felt my line vibrate, a king cut my sinker off when I had the fish a good 20 feet from the surface. 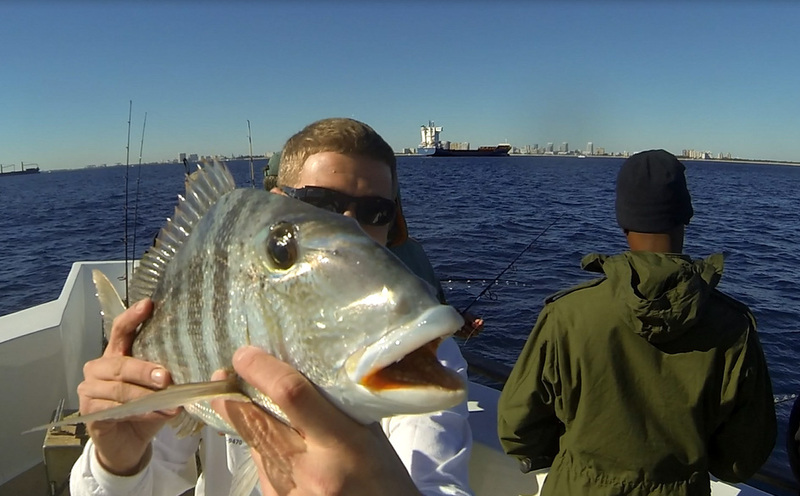 Lesson learned: Spray paint my shiny leads in the future… We kept on fishing for yellow tails to see if we got some flags we ended catching some in the 24 inch range. 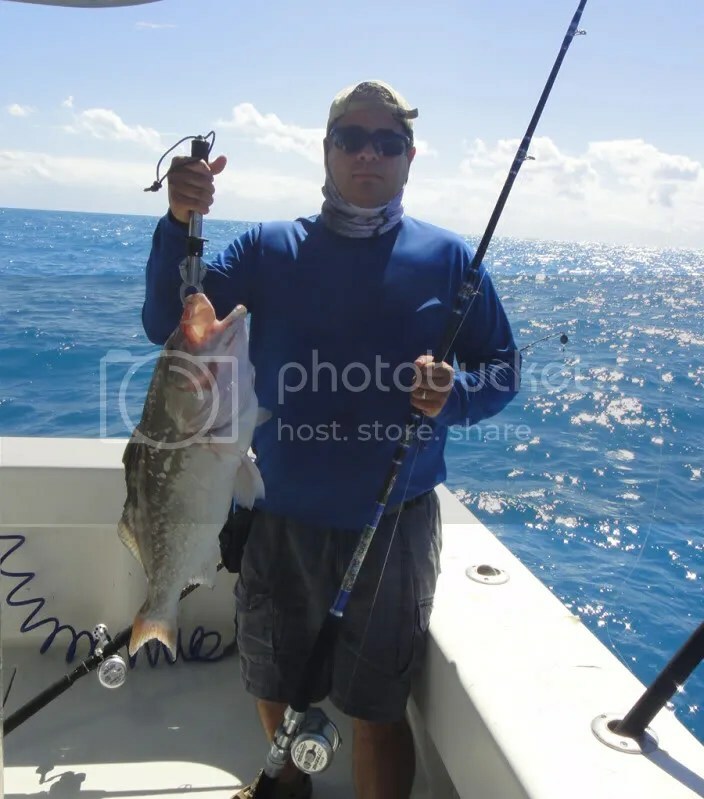 Nelson, Jorge, and Rob kept on picking at the muttons while most of us were trying for more groupers and then they joined us as well. 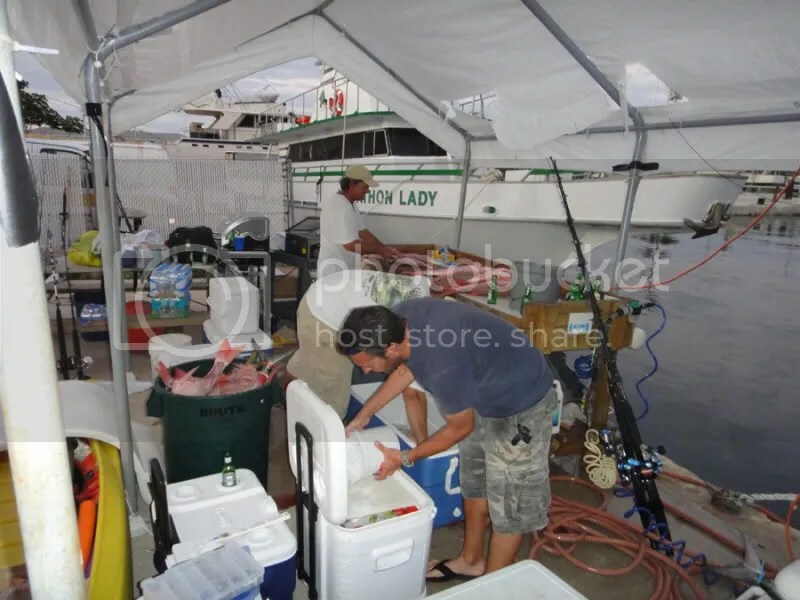 The morning slowed down and was time to go so we had to rearrange all coolers and drink all drinks since we had run out of fish space. The smorgasbord followed with Ricky eating his first Hot pocket ever, LMAO!!! He kept hearing hot pocket this hot pocket that until finally he had one. BACK ON LAND! We unloaded and carpeted the floor with our catch, started to get ready to load all our stuff when we went to check the truck I opened it and Rory and I got hit by a MASSIVE! Nasty smell of the squid that was left on my cast net in the truck bed (the net still dipped in fabric freshener! 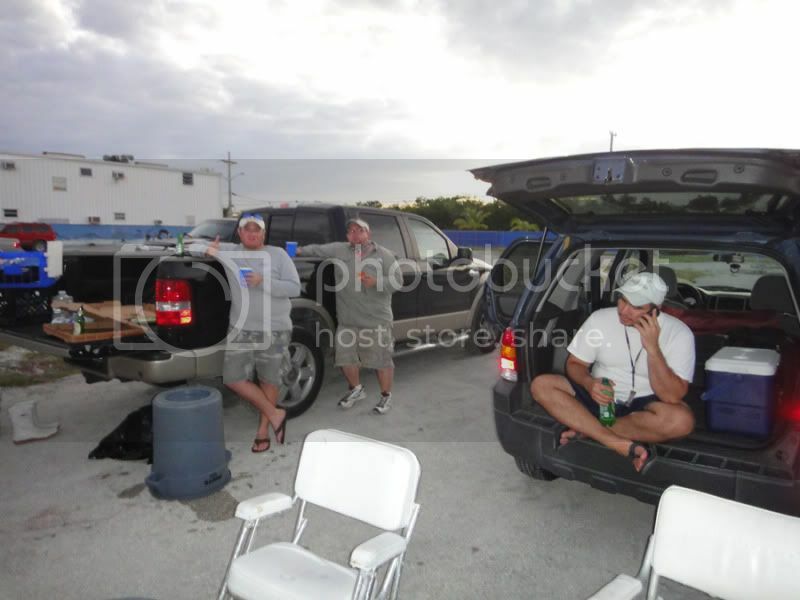 LOL Well my truck stinks a mile away, I have to park in the far corner of the lot, LOL…Some got their fish cleane for 30 bucks an hour. I regret not doing so! I just finished cleaning mines a few hours ago and what a mess I have in my back yard. My neighbors are going to love the smell tomorrow afternoon, LMAO!!!! Well that’s the end of some of the stories/report here are some more pics for those that skipped all the mumbo jumbo I wrote, LOL! 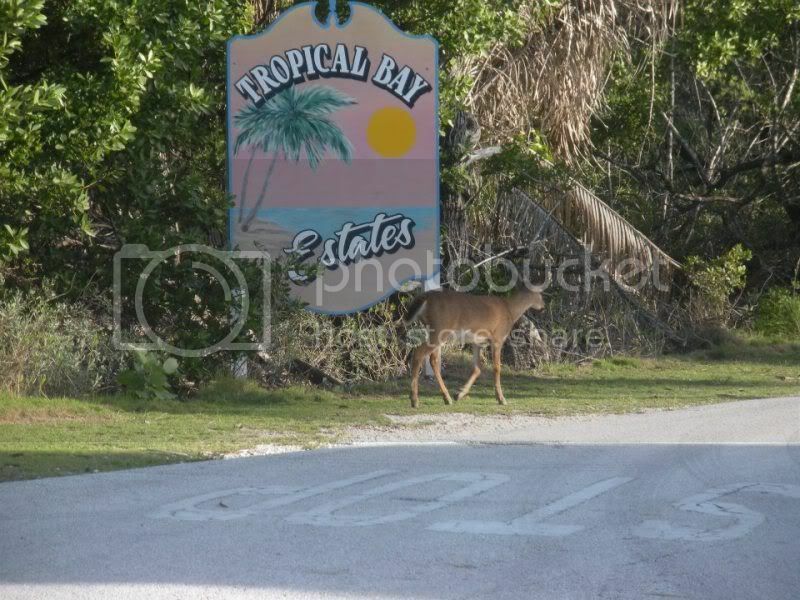 On our way to No Name Key for more bait gathering we spotted an endangered Key Deer. They are very small deer due to the small size of the islands and are losing their habitat. 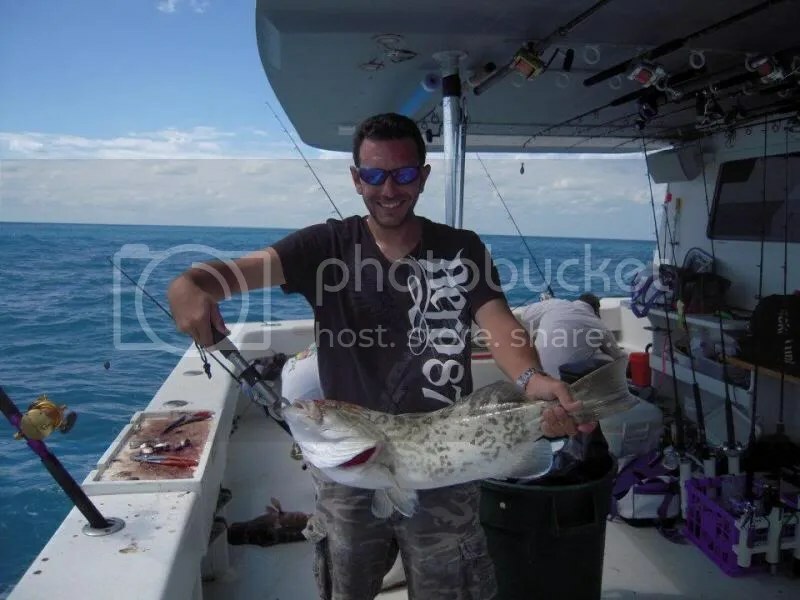 A variety of other groupers were caught and released by just about all the anglers on board. 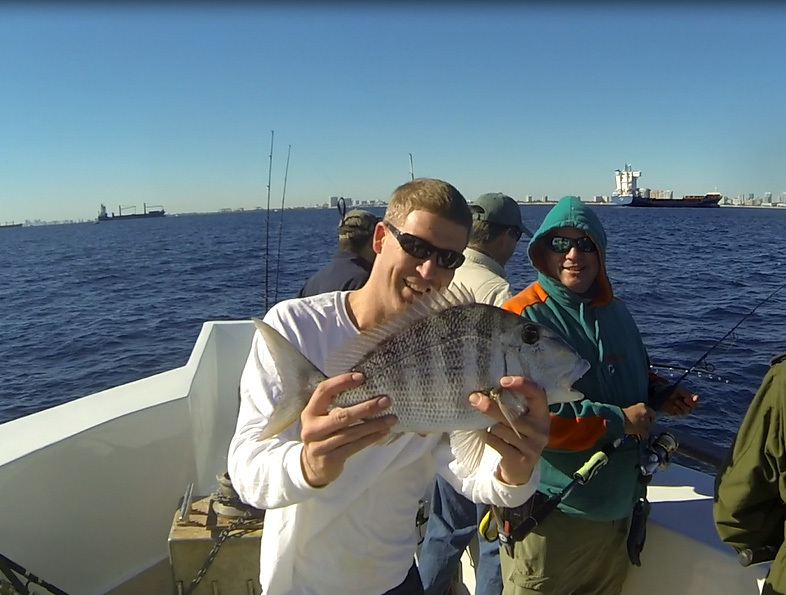 A total of about 160 fish kept and many, many released. 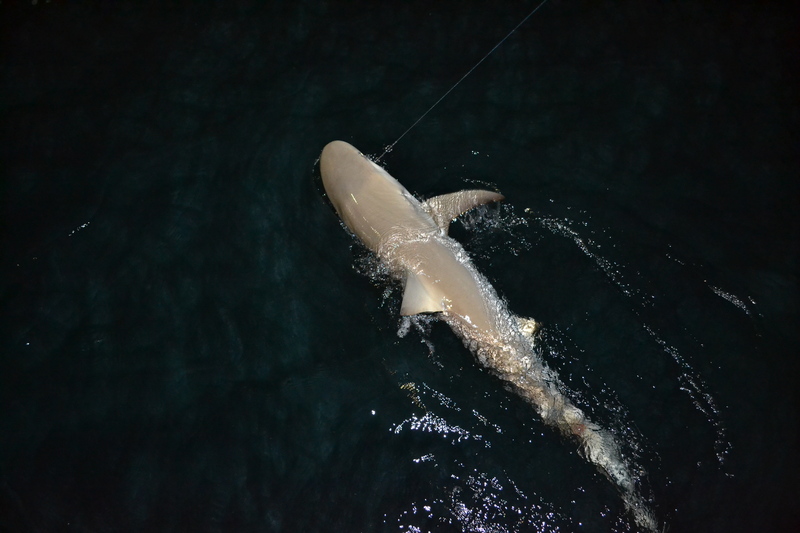 The biggest muttons caught were at 16.2 pounds by Herbert (cudaman) and one of same weight by Nilson (rare). Dead bait worked better by switching to different baits as often as the bite slowed down.